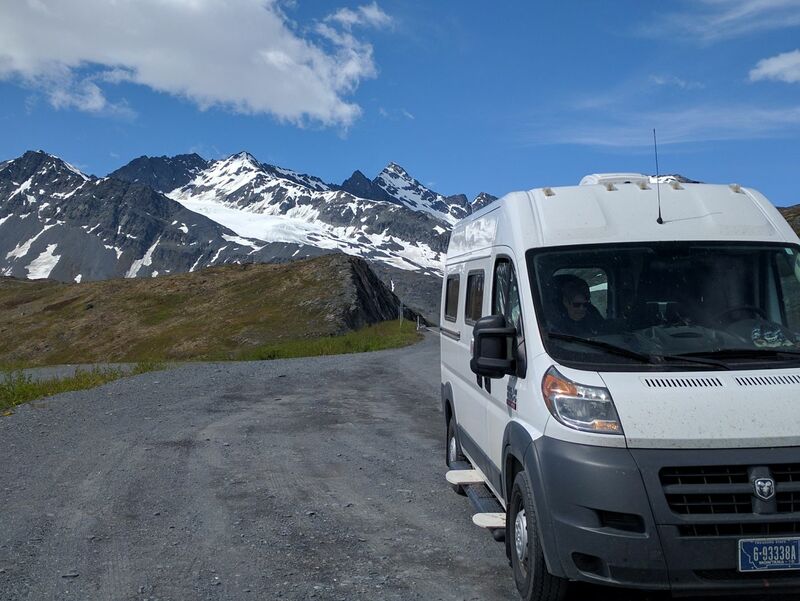 This was our fourth trip up to the Yukon and Alaska, but the first in the ProMaster camper van conversion. 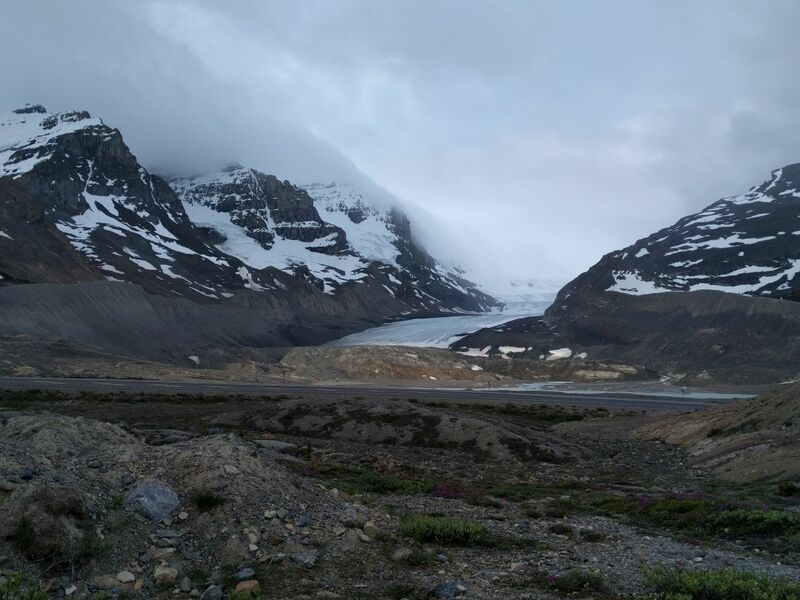 So, this is a report on how things worked out on the van, travel tips for the Yukon, emergency equipment to carry, and some highlight destinations we particularly liked. 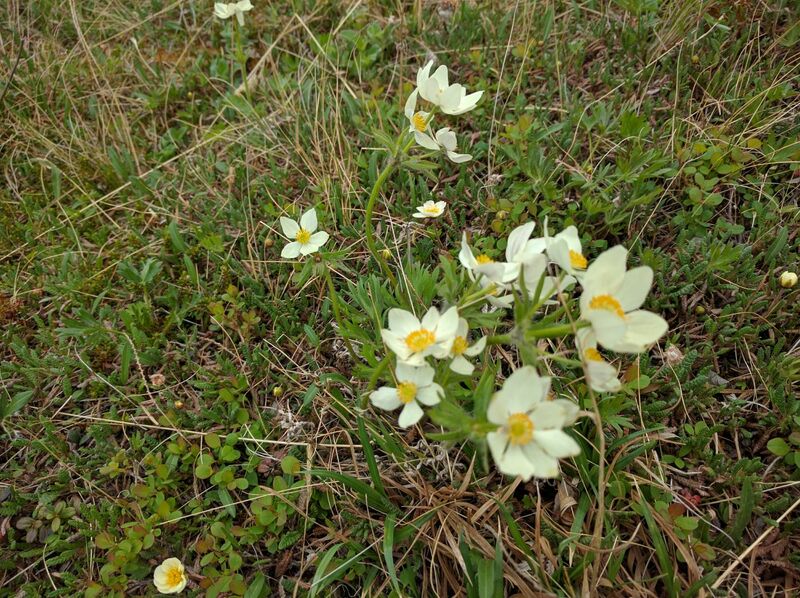 We mostly stayed in provincial parks which were uniformly nice and well maintained. We did not make any advance campground or motel reservations, and had no problems, but I think that a couple more weeks into the season and things would be filling up. We did not use shore power at all (even when it was available). We tracked use of consumables (water, propane,…) just as a guide for future trips. Water: We refilled the fresh water tank (18 gallons) and emptied the gray water tank three times over the 22 days. This was with eating in restaurants about half the time. Propane: Started with a full propane tank (20 lbs) and came back with 6.7 lbs left in the tank. So, we used about 13.3 lbs (3.2 gallons). This was for cooking and running the furnace. It was warm enough that we only ran the furnace about an hour a day in the morning, except on one cold night where it probably ran about 4 hours. Battery: I logged the State of Charge each morning, and it was generally about 90% . The lowest was 85%. The electrical loads were: fridge, lights, furnace fan, Maxxfan ventilator, TV/DVD, and charging devices. The days were very long (near 24 hours), so lots of solar charging. I also had the inverter on standby all the time — this makes it ready to pick up AC loads as soon as they are turned on, but it uses about 0.8 amps all the time. 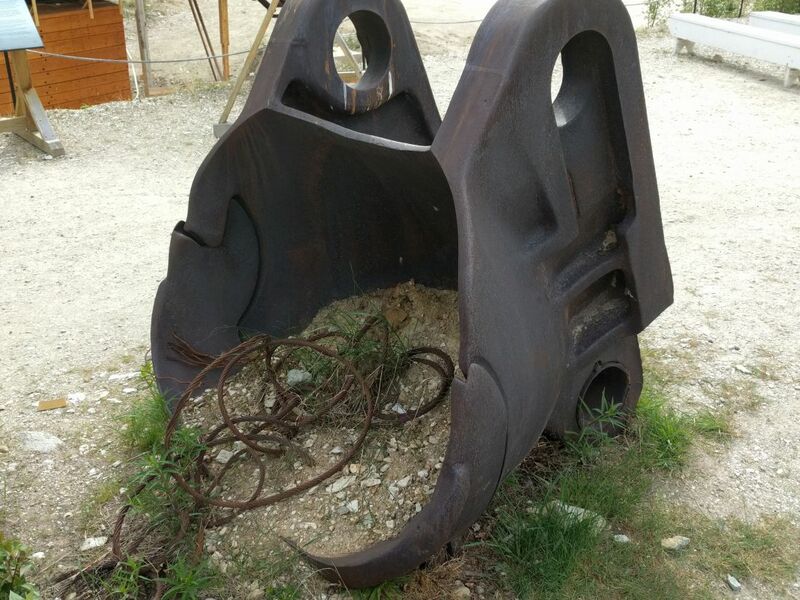 Composting Toilet: We have a homemade composting toilet. We emptied it once during the trip near the end. This sounds like a messy job, but you just pull out the plastic kitchen bag lines the toilet bucket, pull the bag ties tight, and throw it in the dumpster — takes about a minute. 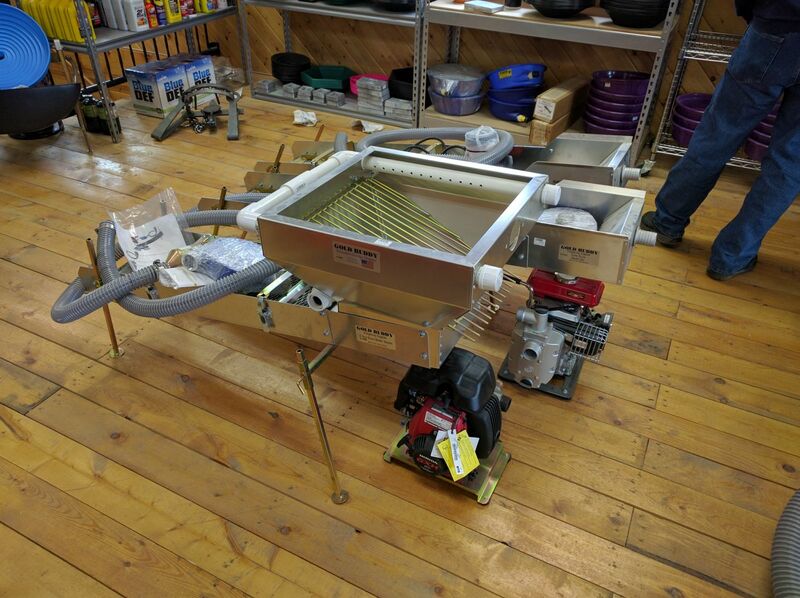 Very happy with the composting toilet — read the details here. So much better than a black water tank. PM Oil: Checked the PM oil level several times and always at the full mark on dipstick. PM Coolant: did not detect any drop in the coolant expansion tank level. 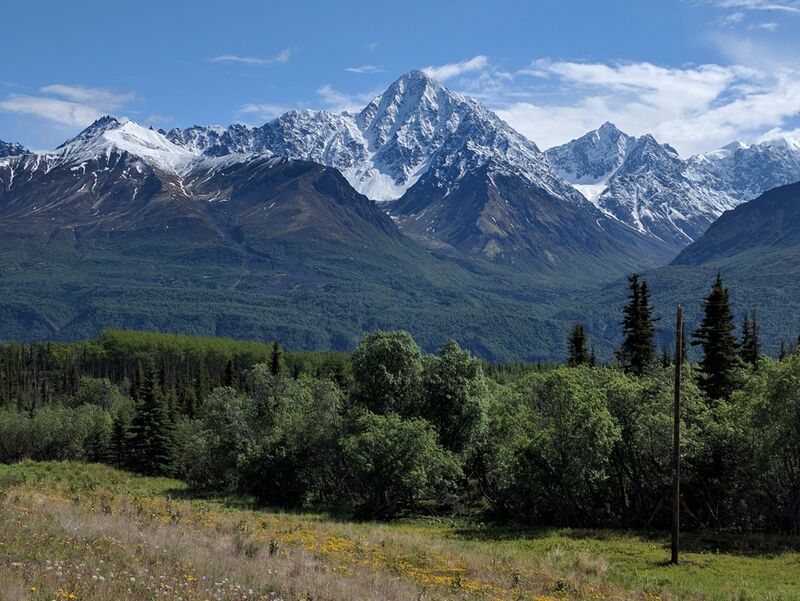 Generally traveling in the Yukon and Alaska is not all that different than rural parts of the lower 48, but here are a few things to keep in mind. Yukon and Alaska are famous for highways with car-eating frost heaves and potholes. You have to very alert for these and take them at a lower speed. Occasionally you will misjudge the speed and get a real roller coaster ride. One thing I have to say for the ProMaster is that the suspension handled the occasional taking a frost heave too fast very well — it never bottomed out or made ominous noises. This has not been true for some of the vehicles we have driven up there on previous trips. 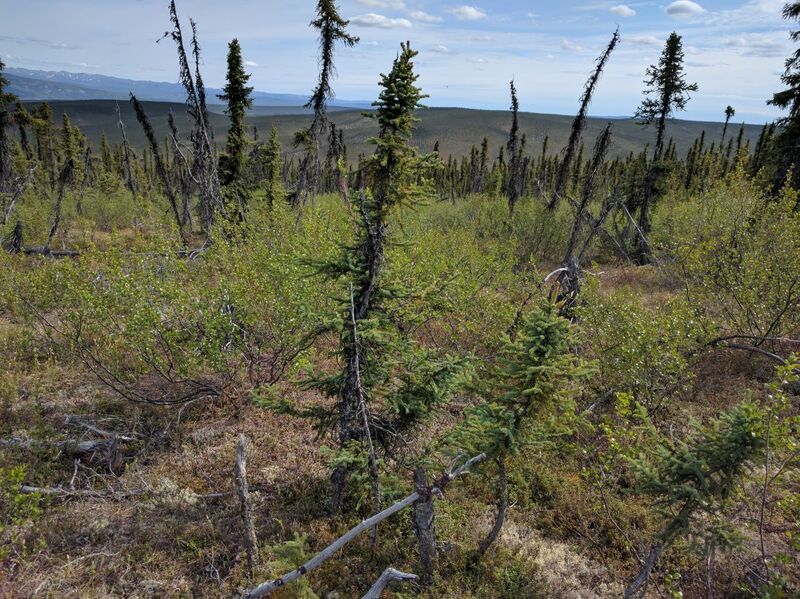 There are really large areas of the Yukon and Alaska that have no cell phone or internet coverage. You may be without cell service for multiple days in a row. Internet when you do find is generally poor quality and low speed. 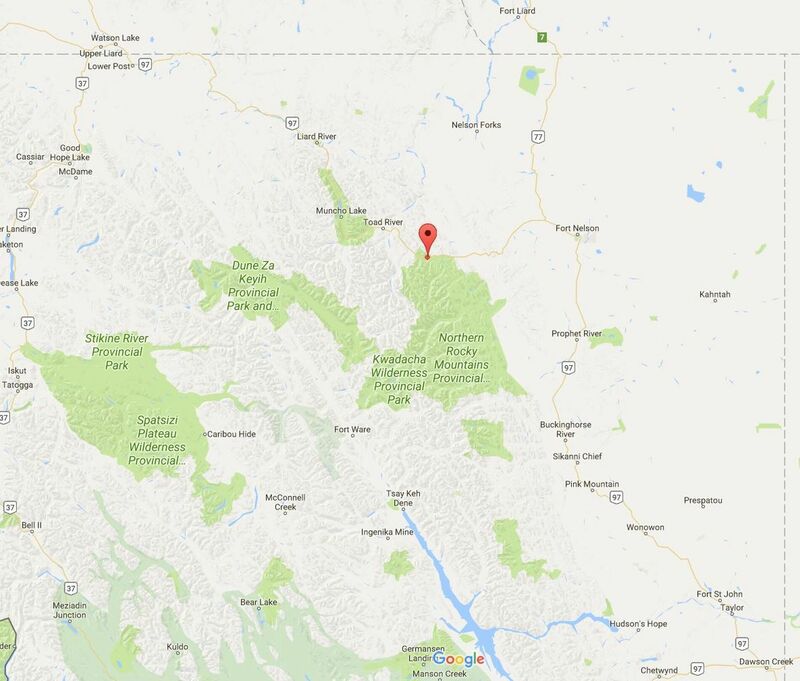 Yukon cell coverage for Bell (the best) — not good, but yours is probably worse. 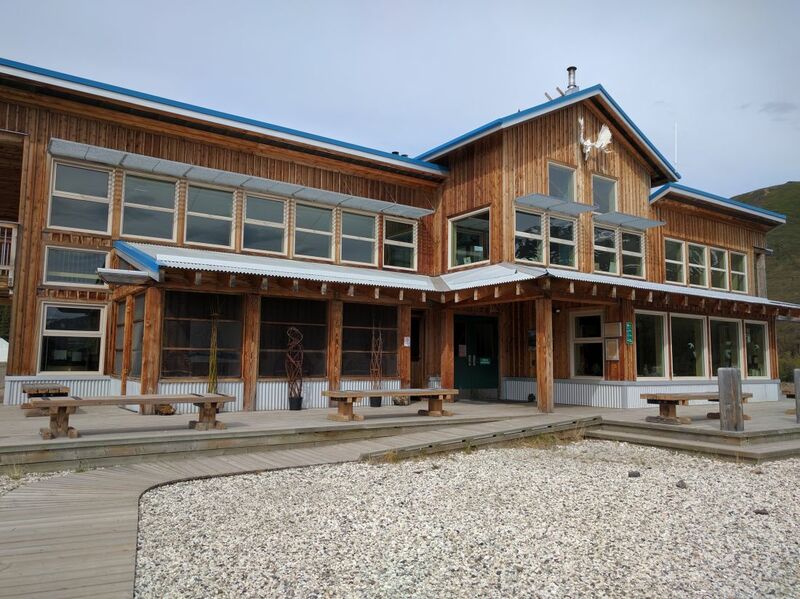 We found that one source of generally pretty good free internet was Visitor Centers — so, you can get good local info and internet in one place. 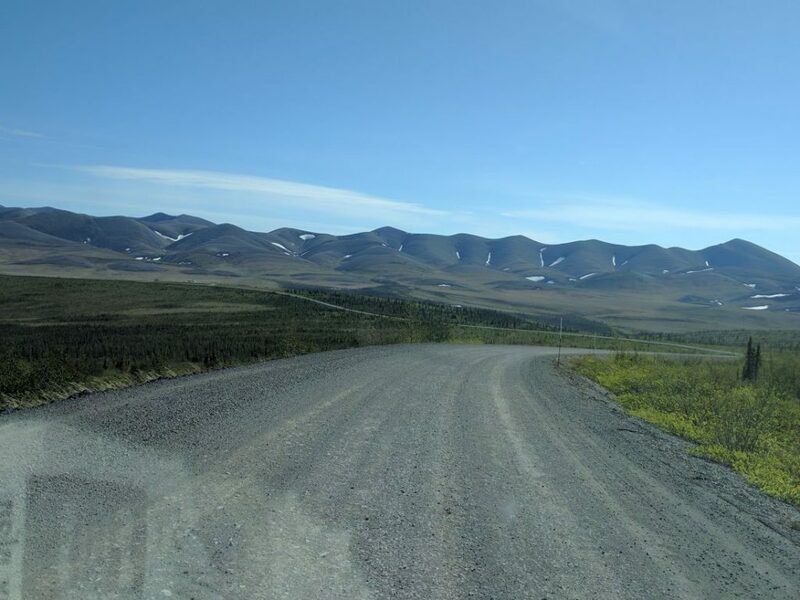 You can do the main parts of the Alaska Highway with very little gravel, but if you want to see some of the more out of the way places, you will be spending quite a bit of time on gravel. We did well over 500 miles on gravel. In our experience, most of these gravel roads are in good shape. But, get used to going slow to make life easier for your tires and your vehicle. Tire failures on gravel roads are quite a bit more frequent, so be sure you have a full size spare and the tools to change it. I think its well worthwhile to go through the whole operation of changing out one of your tires for the spare in your driveway before you leave. Between the over tightened lug nuts and spare tire winches that don’t work, its well worth going through the whole thing before hand. Our Emergency Equipment page has more on this. We tried to help one Alaska lady firefigher with a flat tire, but one of the lug nuts was just impossibly tight. She ended up using my cell phone (hers had no service) to call for a toe truck which had to come 90 miles to pick her up. 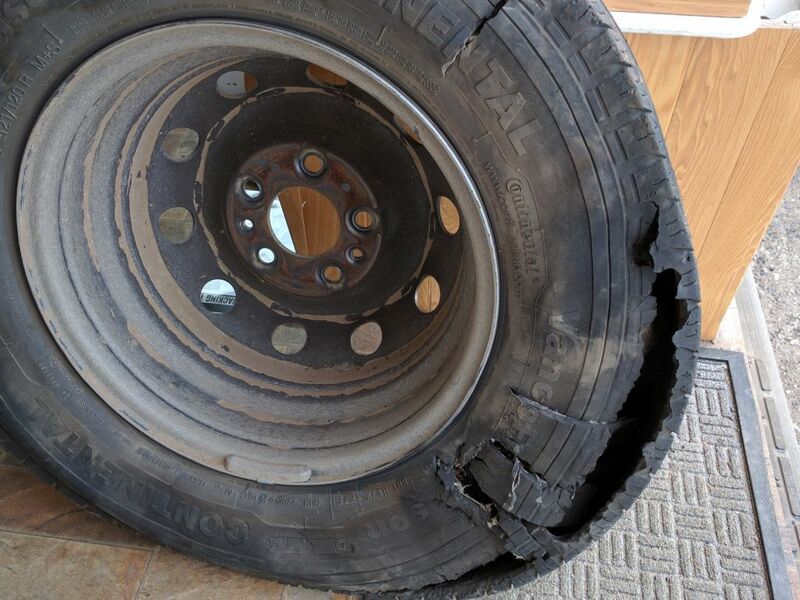 You may want to consider carrying a 2nd full size spare if you plan to do a lot of gravel road travel. 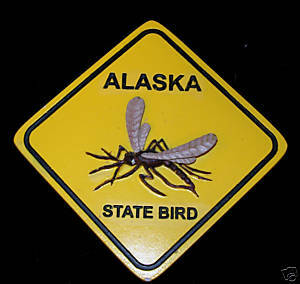 Bugs can be a pain in the Yukon and Alaska. We carried some extra stuff in anticipation of lots of mosquitoes, including: screen for the sliding door, head nets that are integrated with a hat, Thermacell mosquito repellent, mosquito coils, and spray on bug repellent. We ended up using only a little spray on bug repellent (DEET) a couple times as we were just early enough in the season to miss most of the bugs — but, its good to be prepared for bugs. If you travel in the summer, days are very long. 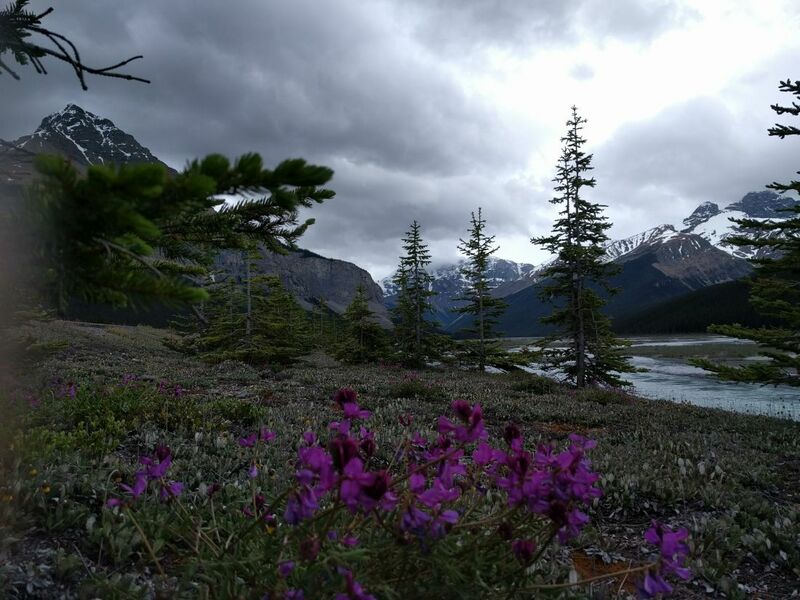 In the Yukon, there is light essentially 24 hours a day (even south of the Arctic Circle). This is great for lots of time to do activities in, but it can be a problem getting to sleep at night — we were thankful for having opaque window covers for all of the windows. Of course, in the winter the opposite situation applies — very short to non-existent days. Our RAM ProMaster van just ran like a top the whole way — it never skipped a beat. We did have tire destruction event on the Dempster, but not the ProMasters fault. 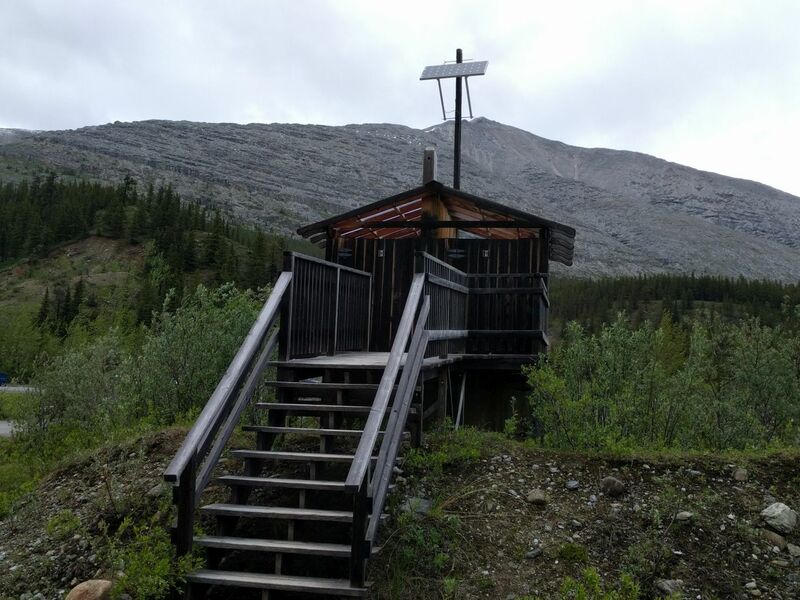 The conversion components: water system, grey water system, electrical system (batteries, wiring, inverter, solar charging, lights, TV/DVD,…), furnace, stove, propane system all performed flawlessly through the whole trip. This has not been the case on some of our past trips, so I’d be prepared for some failures. Given that we were going to be doing 500+ miles of gravel roads and that Yukon highways are famous for man-eating frost heaves and potholes, we beefed up the list of emergency equipment that we carry for tire failures and general mechanical and electrical repairs. This has grown into a pretty long list of stuff, so I put it on a separate page on emergency equipment. In the end, most of this stuff was not used as things performed well, but this has not been the case on all of our past trips, so best to carry the tools etc. and be ready. 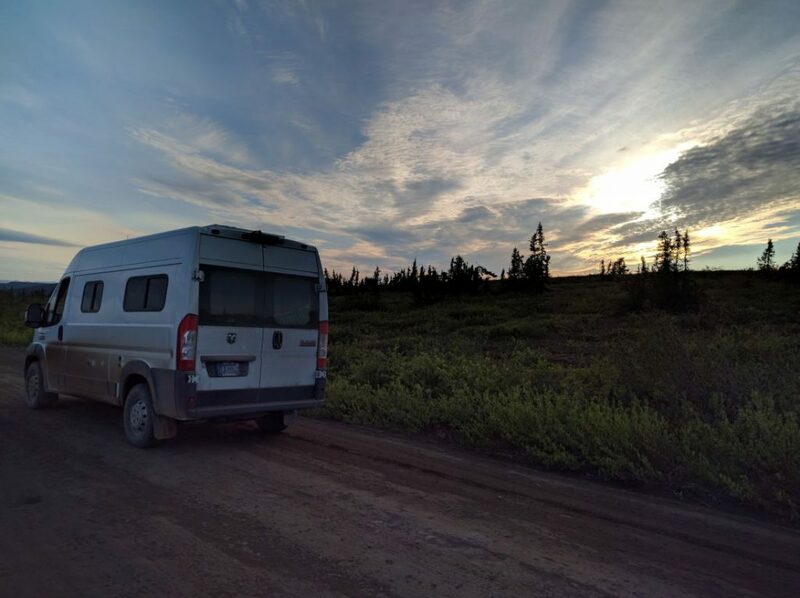 We did have one major tire failure on the Dempster Highway. We had the PM’s full size spare and with the spare installed we proceeded slowly on to Eagle Plains, which is the only tire service within 200+ miles in either direction. At Eagle Plains, they ended up having to order us a couple tires that got trucked in from Inuvik, NT. This took about a day and half, which we spent at Eagle Plains enjoying their nice facility. 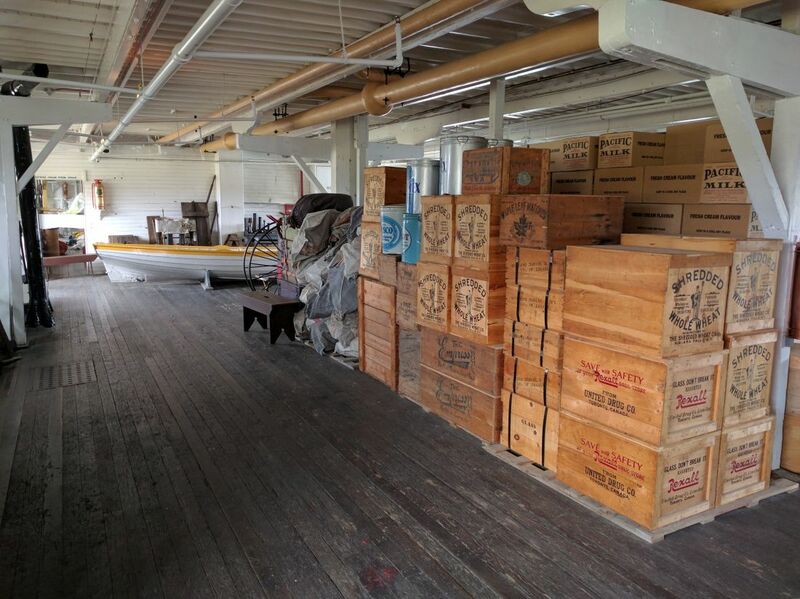 I have to put in a plug for Eagle Plains — they did a great job for us finding the new tires, getting them shipped, cooking up great food, and keeping us well informed about how things were progressing — thanks very much to Stan and the tire shop guys! We had thought about carrying a 2nd full size spare on the trip, which would have been mounted to the back door, and in hindsight, this would have saved us some time and money. We did add a tire puncture repair kit and small 12 volt compressor which is helpful for modest puncture repair, but clearly not up to repairing a big time tire failure. In our three previous trips up the Dempster, we did not have any tire failures — I guess the tire Gods were smiling on us. 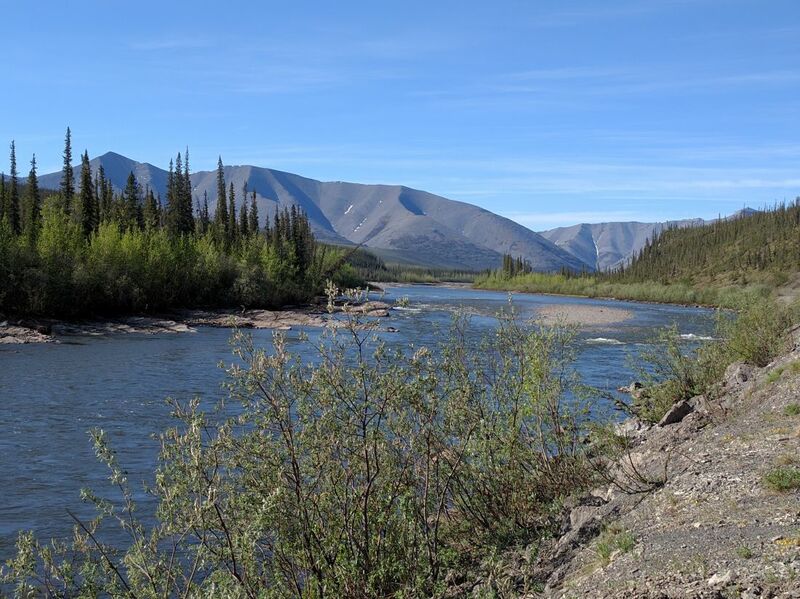 We have been up to the Yukon/Alaska before, so this trip was not intended to sample the whole works, but to revisit some of the places we liked the most on previous trips. 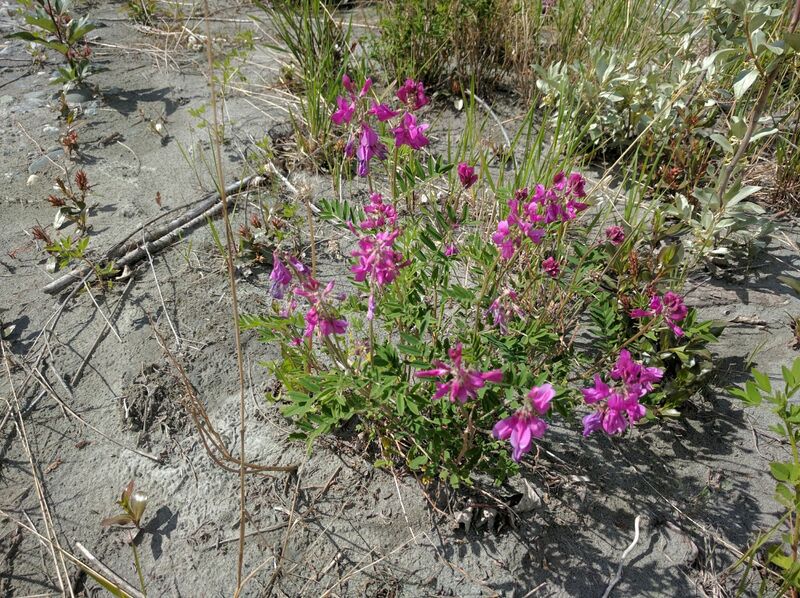 Tops on our list was to do the Dempster Highway again, which we really like. 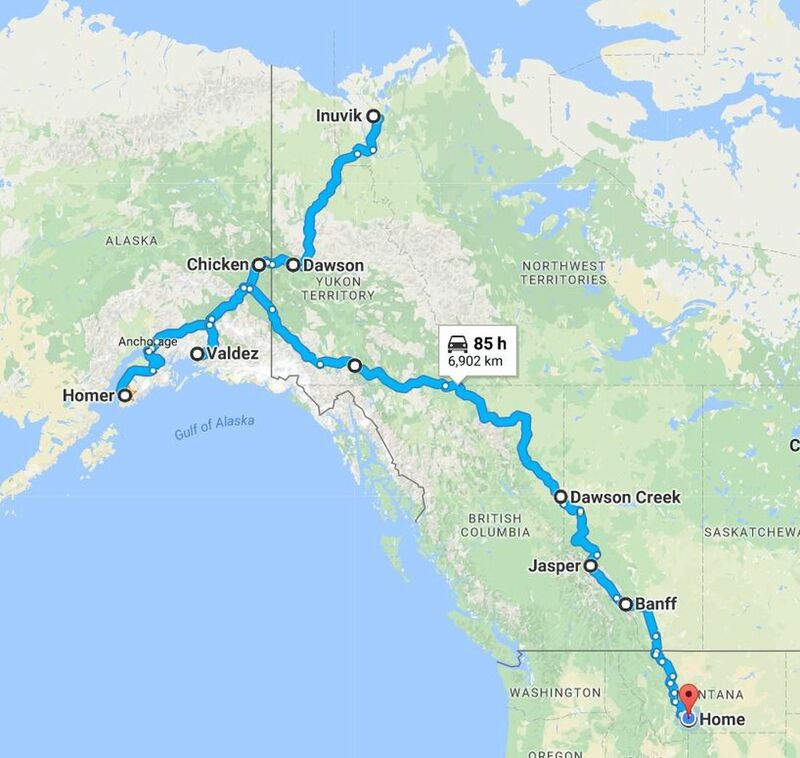 If you are driving up from the lower 48, bear in mind that it takes nearly a week to drive up to the Yukon/Alaska area (depending on where you are coming from and how much you want to see on the way). For example, Bozeman, MT to Dawson City, Yukon is 2200 miles by the most direct route. So, if this is a first trip up there, and you want a pretty good sampling of the main areas, something like 4 weeks (or more) is good. We were just over three weeks, but we were just revisiting a few places we liked on past trips, and we decided that some pretty long (500 to 600 mile) days getting up there and back down were OK. The days are so long, that you can drive 500 miles at a relaxed pace with many stops and they don’t really feel like all that long a day. These are some places we liked a lot, but you will probably find a lot of other places you like. 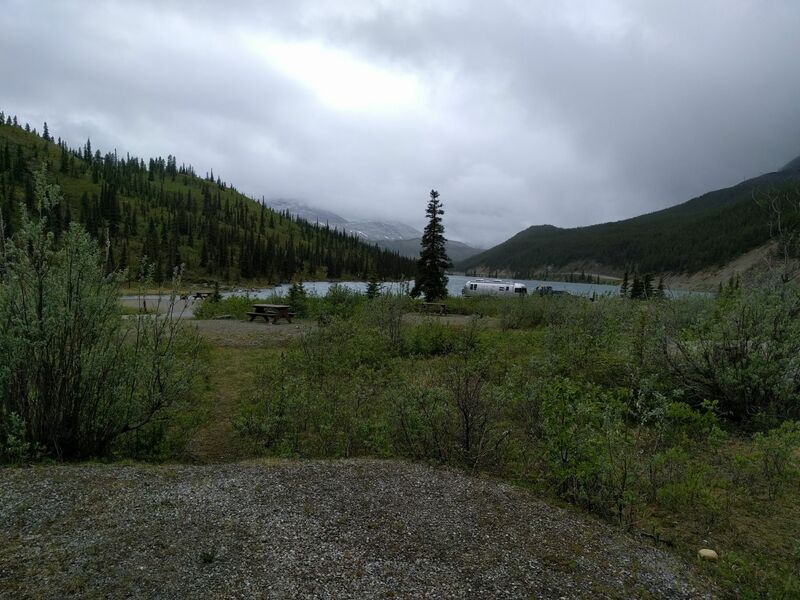 We went out of the way a bit to go up the Icefield Highway (Banff, AB to Jasper, AB), and then east to the Cassiar (east) branch of the Alaska Highway. 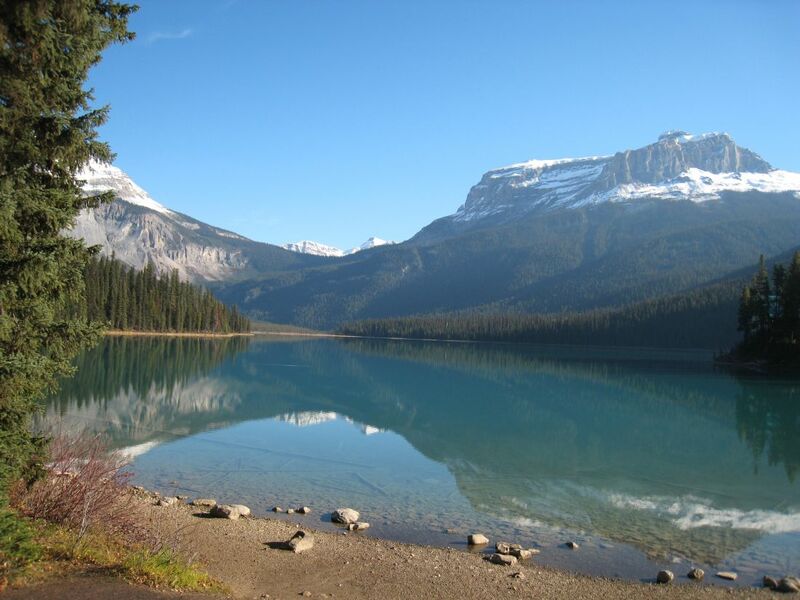 We really like the Banff to Jasper run — its about the most spectacular mountain scenery that you can see from a car anywhere in the world. We have been there many times, but it never gets old. 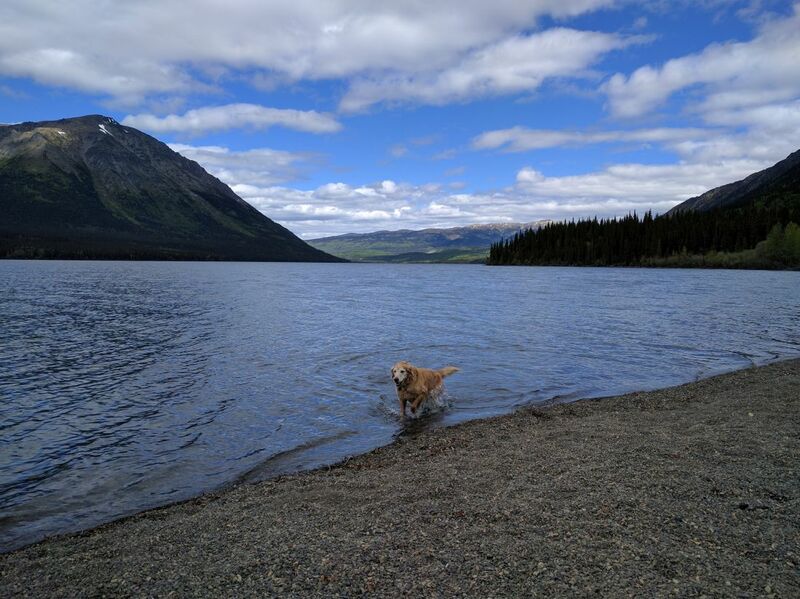 From Jasper, we drove west through Prince George to the start of the Cassiar Highway (hwy 37), and drove it north to Watson Lake where it joins the main Alaska Highway. The Cassiar Highway is basically the west branch of the Alaska Highway. 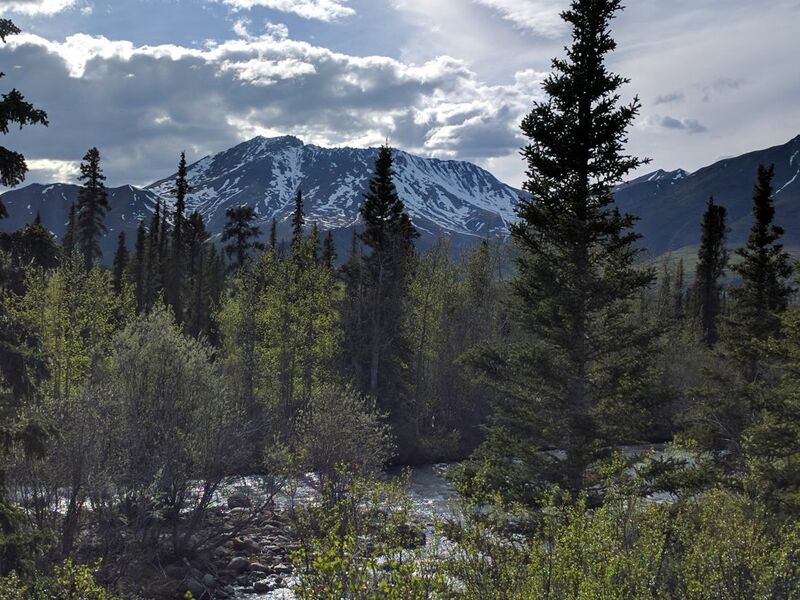 It is much less traveled and developed than the main Alaska Highway, and, to me, it seems more like what most people would expect of the Alaska Highway. It has long stretches of wilderness and only a couple very small towns. The road is paved all the way, but is more curvy and narrow in places than the main Alaska Highway. To me, it feels more like the real thing. The scenery is good too. 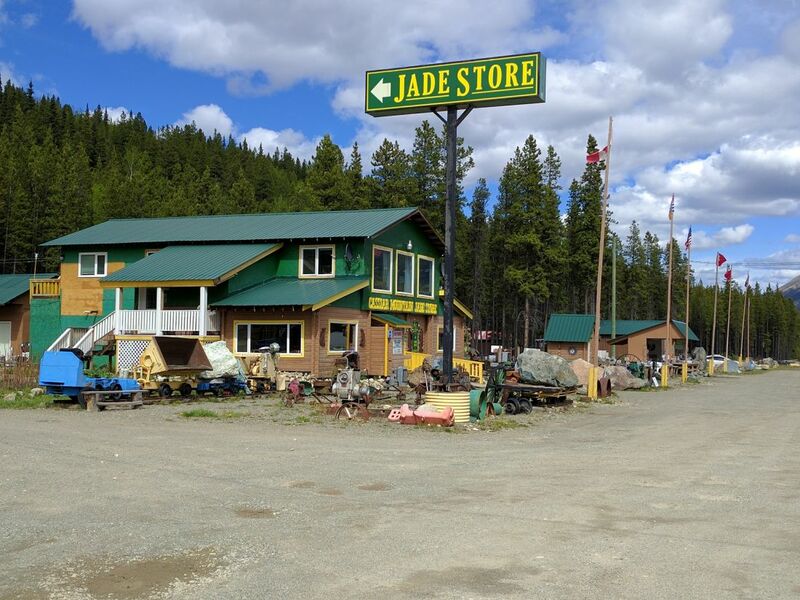 Jade mine and store — interesting stop. 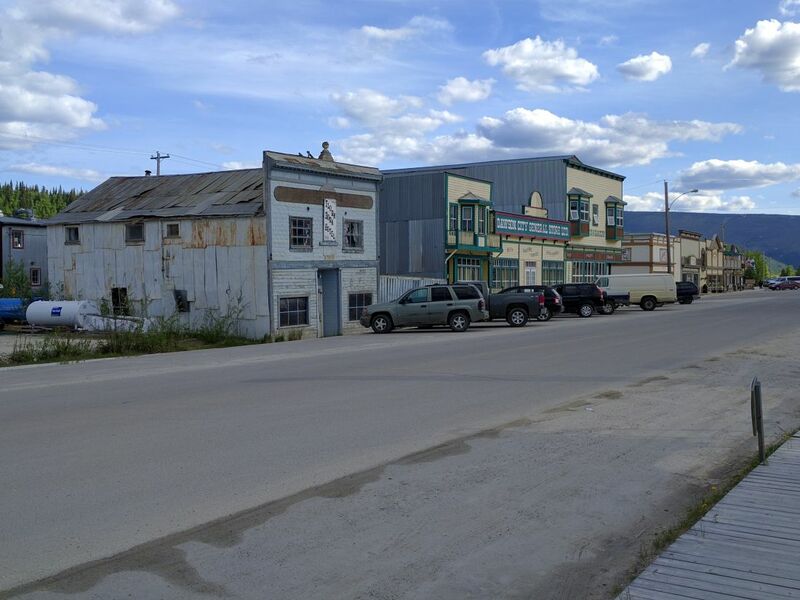 Whitehorse has 23,000 of the 36,000 people who live in the Yukon — so, its the only “big” town. Good place to stock up on things that will be hard to get elsewhere. 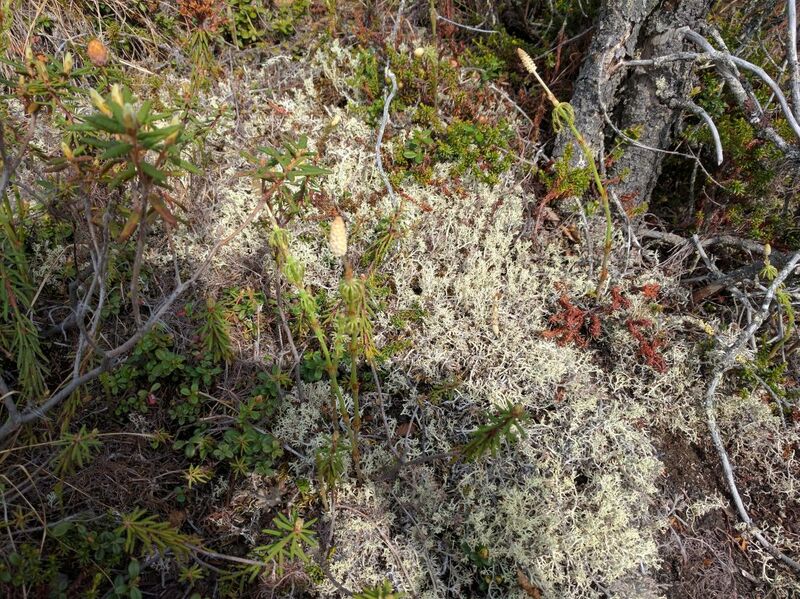 On our last trip up to the Yukon, we picked up the telephone book for all of the Yukon — it was about a half inch thick! 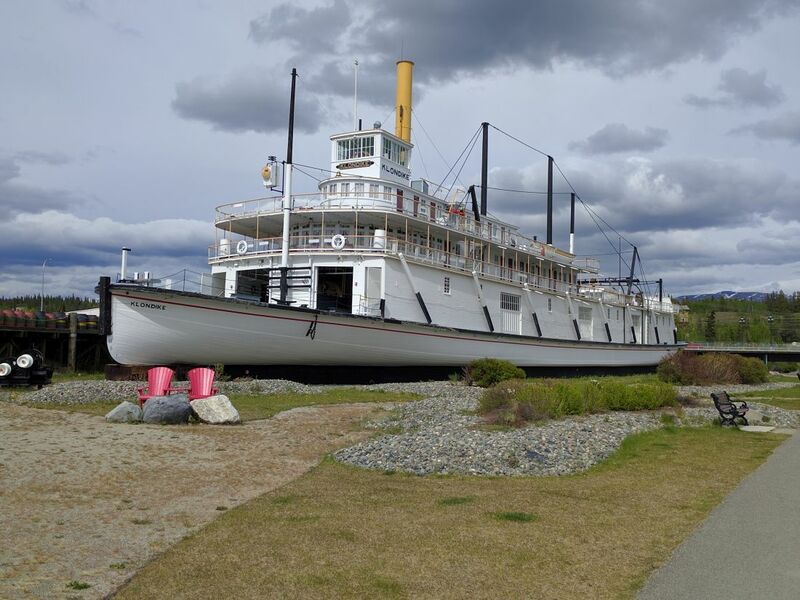 Whitehorse has a very nicely restored steam powered sternwheeler which you can walk through — very nicely done. I guess the Dempster Highway must be our favorite place in the world as we have driven the 2200 miles up to see it four times! 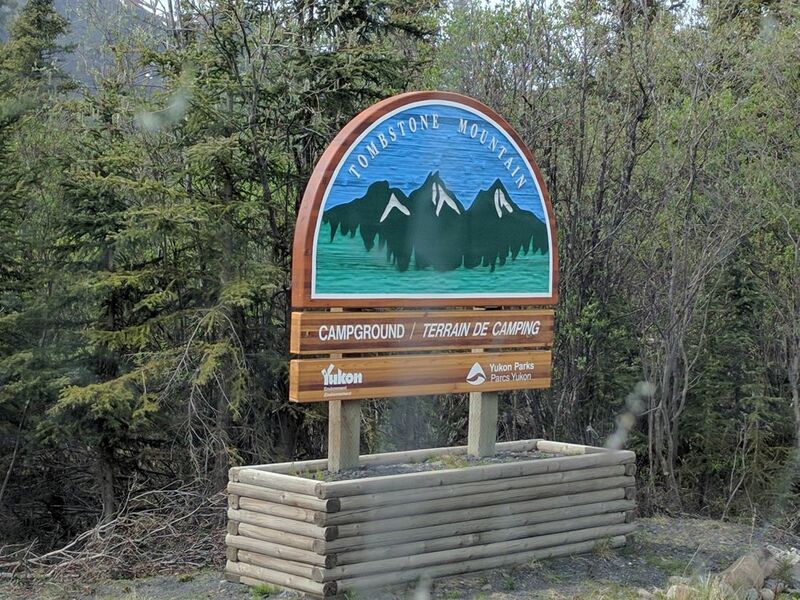 The Dempster (hwy 5) starts about 20 miles east of Dawson City. It extends North for 450 miles to Inuvik in the Northwest Territories. 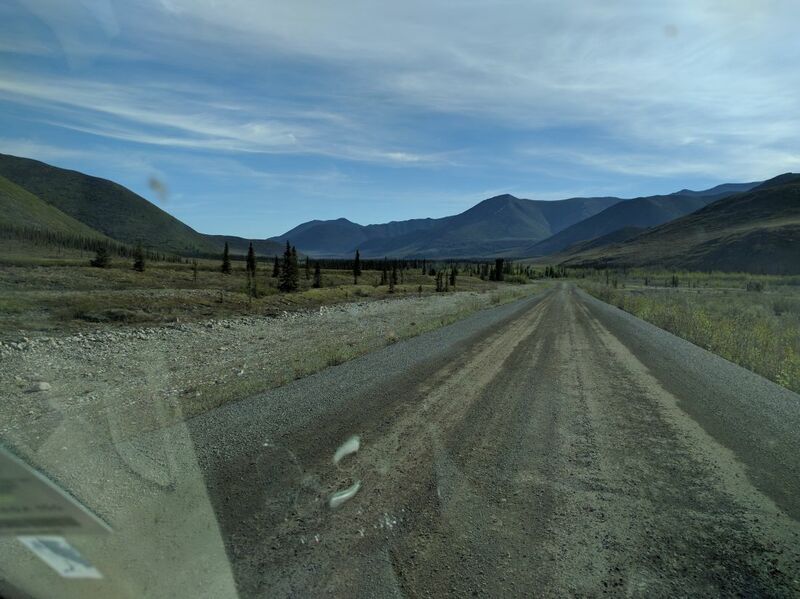 It is all gravel, and the only service is at Eagle Plains which is roughly half way up to Inuvik. It is about as close to true wilderness as you can get and still be on a road. 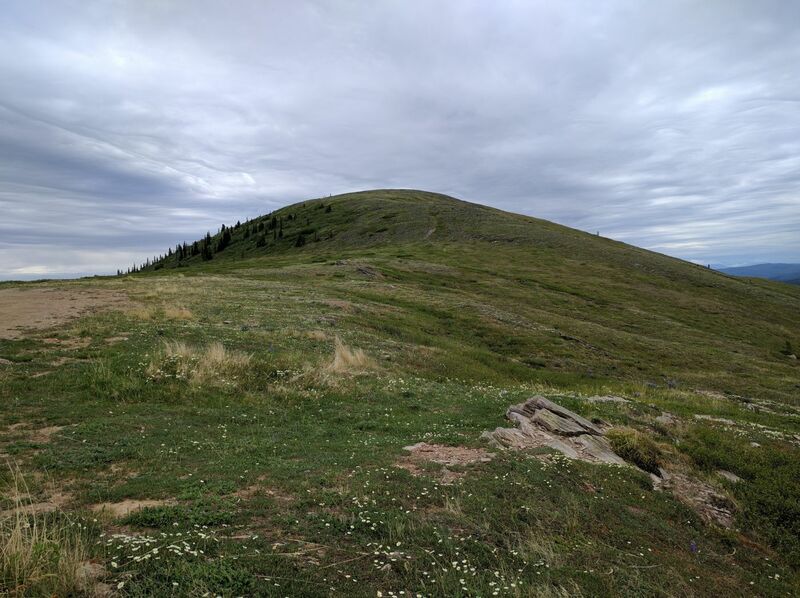 The Dempster goes through three mountain ranges, and as you get further north, there is a transition from lightly forested to open tundra. Its all very remote wilderness with lots of wildlife. Ironic that a road that was built for oil exploration should provide access to such a remote and beautiful area. About 70 miles up the Dempster you enter the Tombstone Wilderness area, which has a new and nicely done Visitor Center. There is also a nice campground. This visitor center and the Eagle Plains gas station are basically the only development along the 400+ miles of the Dempster. Tombstone Wilderness visitor center and campground. 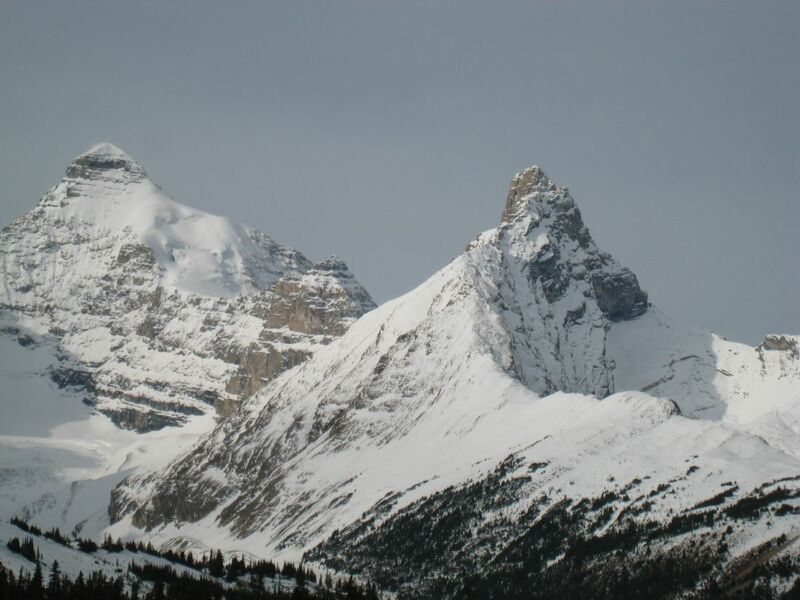 Some of the mountain scenery along the Dempster. 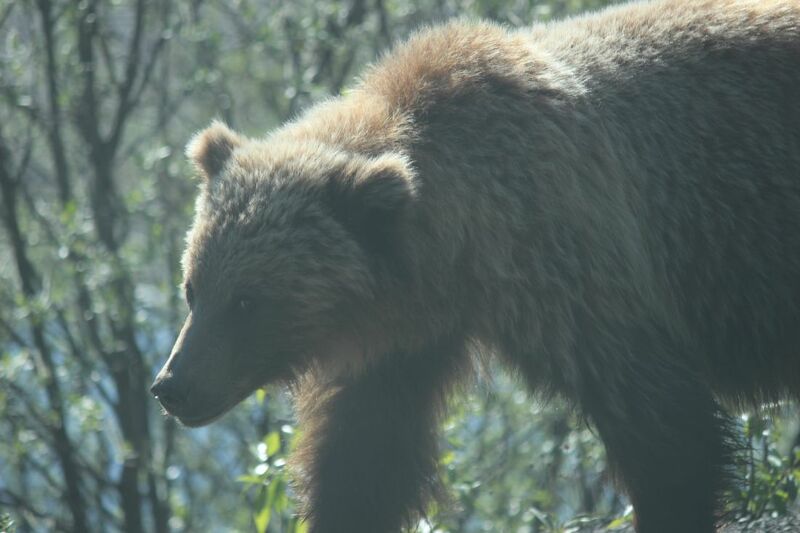 Grizzly walking along the road. Our not so healthy Vanco tire. Eagle Plains — gas, motel, tire service. The Dempster is built on permafrost and to prevent melting of the permafrost, the road was built over a thick gravel pad. During the construction of the Dempster, quite a few “gravel pits” were opened up along the road to build the pad. Most of these are OK to camp in, and some are in truly spectacular settings. Just avoid the few that are still active or that have driving hazards. “Gravel pit” does not sound to inviting, but most are not really pits, but just flat areas off the highway. We used one on the way down. They are also good places to see the Northern Lights if you are up there when the days are not too long. 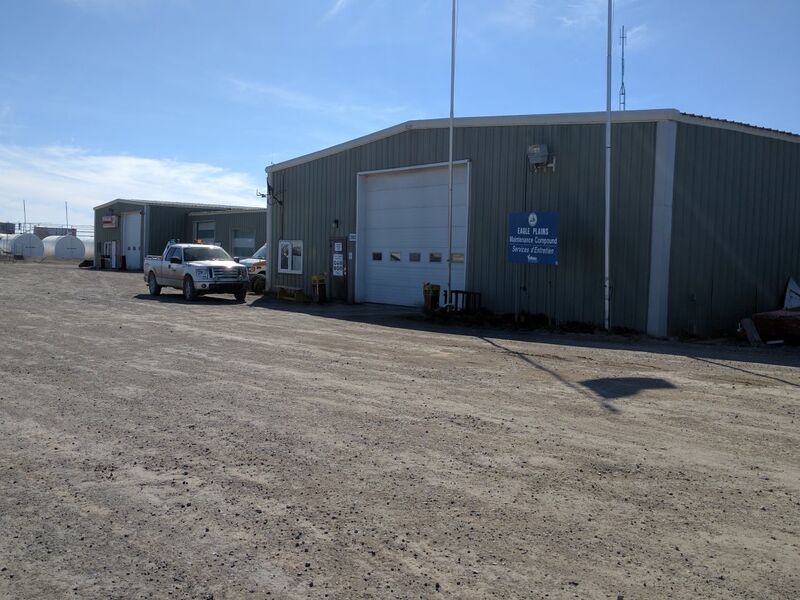 If you go all the way to Inuvik in the Northwestern Territory, you will likely be surprised that a pretty good sized town with a large variety in businesses is at the end of this very long gravel road. 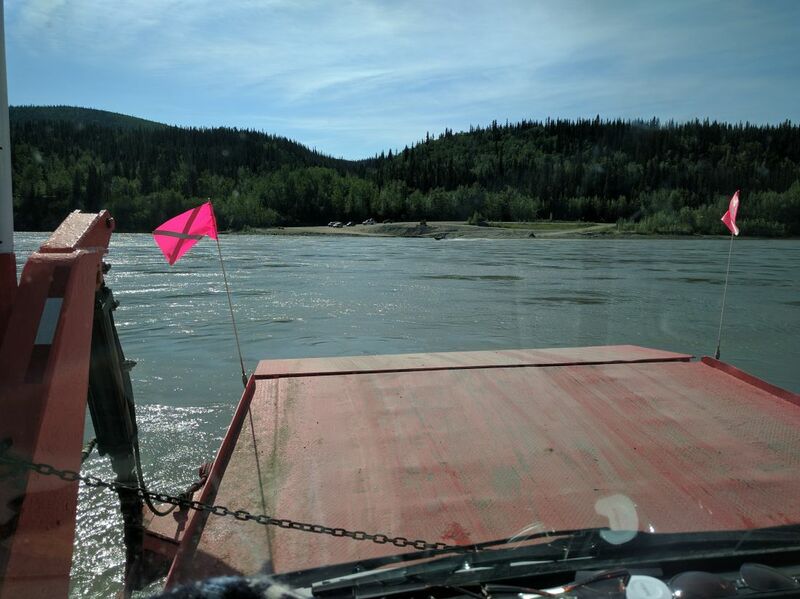 In getting to Inuvik, you cross two rivers by free ferry. The crossing of the rivers is by ferry in the summer and by ice road in the winter. There is a time period around the breakup of the winter ice in the Spring and the freezing of the rivers in the fall when the road is closed — so check ahead. 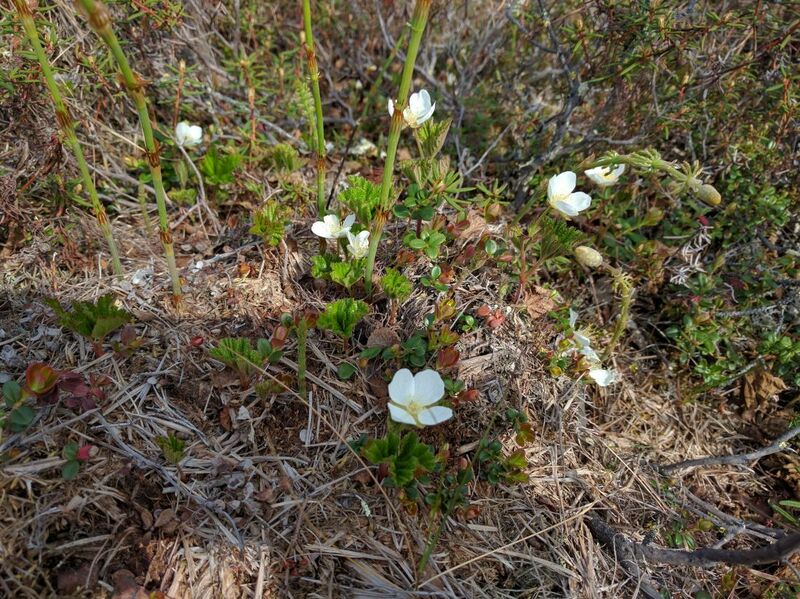 We did not go all the way up to Inuvik this time as the scenery on the norther part of the highway is not as compelling as the south part, and we have been up to Inuvik a couple times. 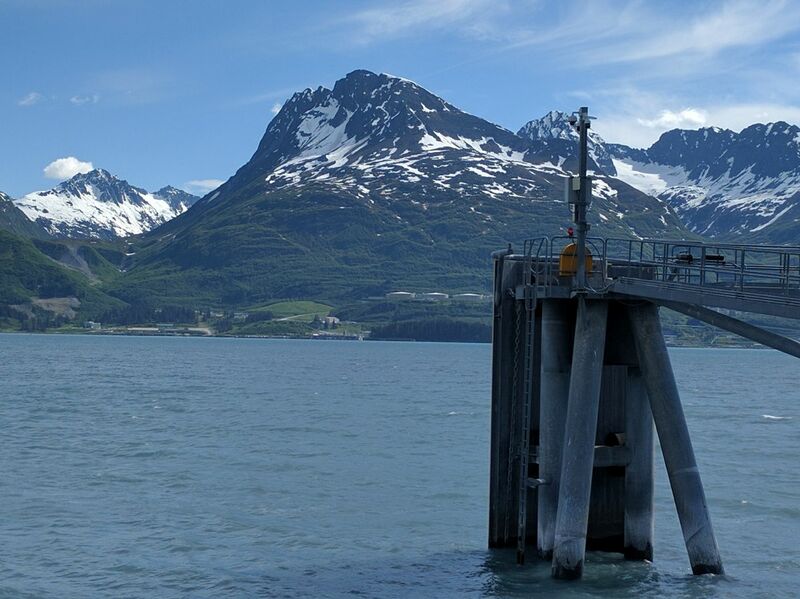 We did go somewhat north of the Arctic Circle to see the Richardson mountains, but stopped short of the first ferry. From Inuvik, you can also continue on to Tuktoyaktuk on the shores of the Arctic ocean. 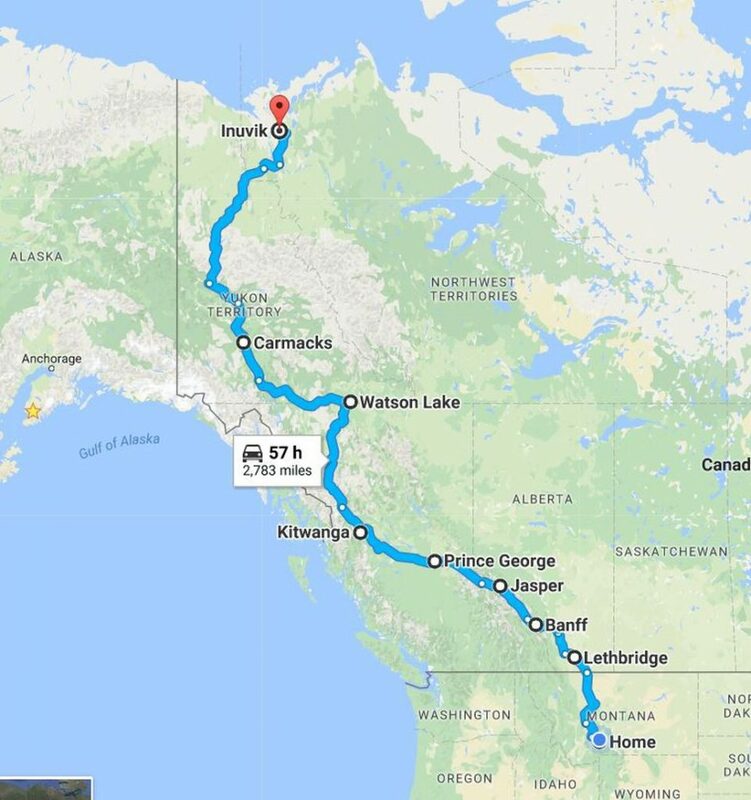 Up until this year, you could drive to Tuk on an ice road in the winter, or fly up in the summer. But, they have been working on an all year road from Inuvik to Tuk — it is due to be opened in the fall of this year (2017). 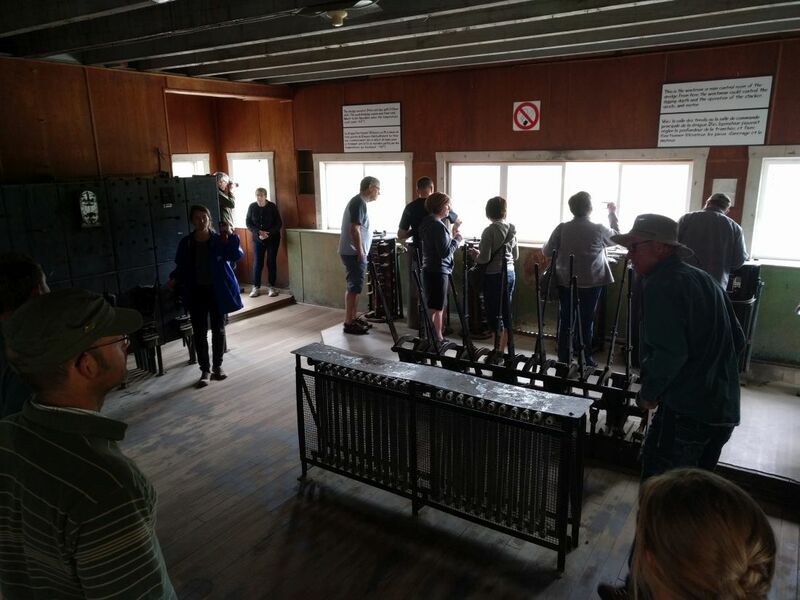 We flew up to Tuk on a past trip, and its an interesting place — part of the flight price was a tour of the town, which was also quite interesting. 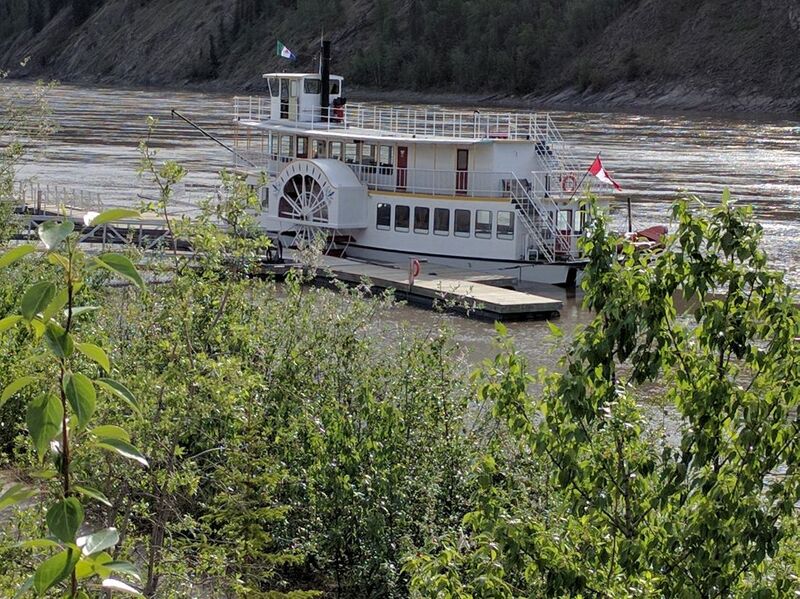 We really like Dawson City. Lots to see in the way of museums etc. 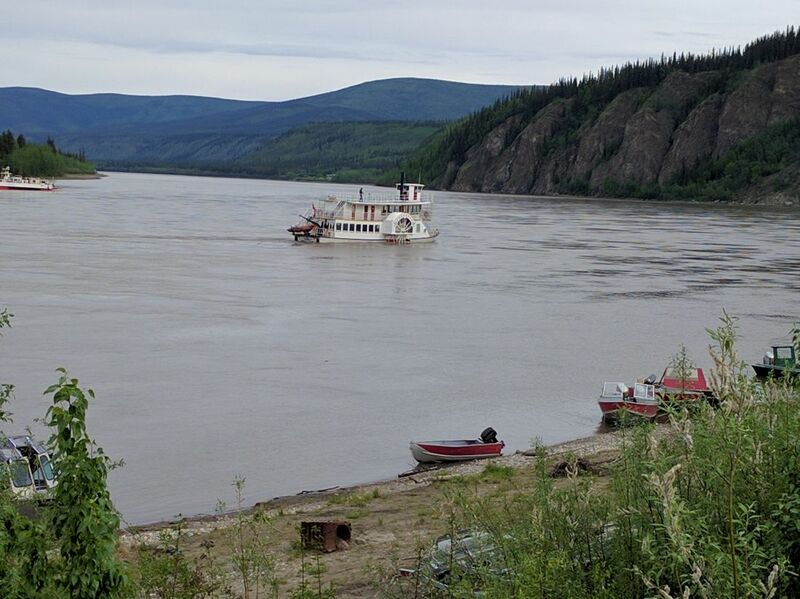 Located right on the Yukon River. Mining activities (old and new) nearby up the Bonanza Creek road. 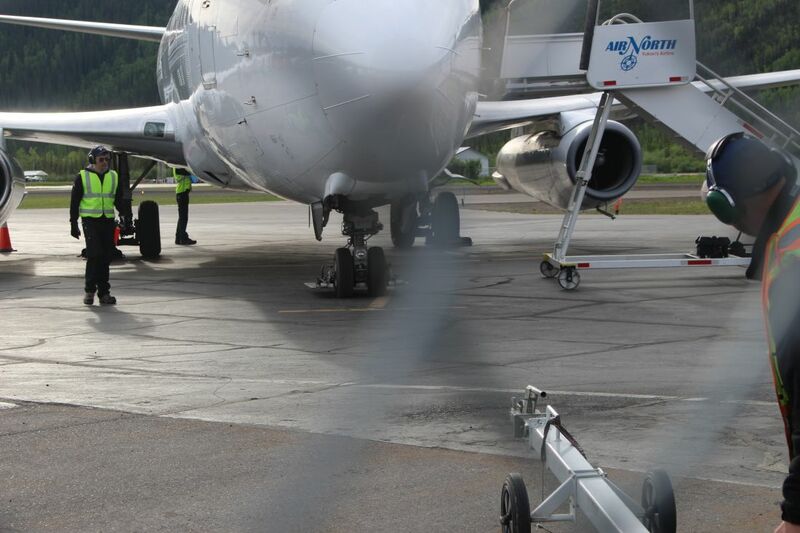 They fly 737’s into the Dawson airport, and the one pictured is one of the few sold with the gravel runway package. The ski around the nose gear keeps gravel from being thrown up by the nose gear tires into the engines. The gravel kit was a panic project at Boeing that I worked on back in the late 60’s. If you are at all interested in the historical gold mining activities or just engineering stuff in general, then the tour of Dredge 4 is just amazing. Parks Canada has restored the dredge to near original condition (it sunk and was flooded for years, so it was a big restoration job). 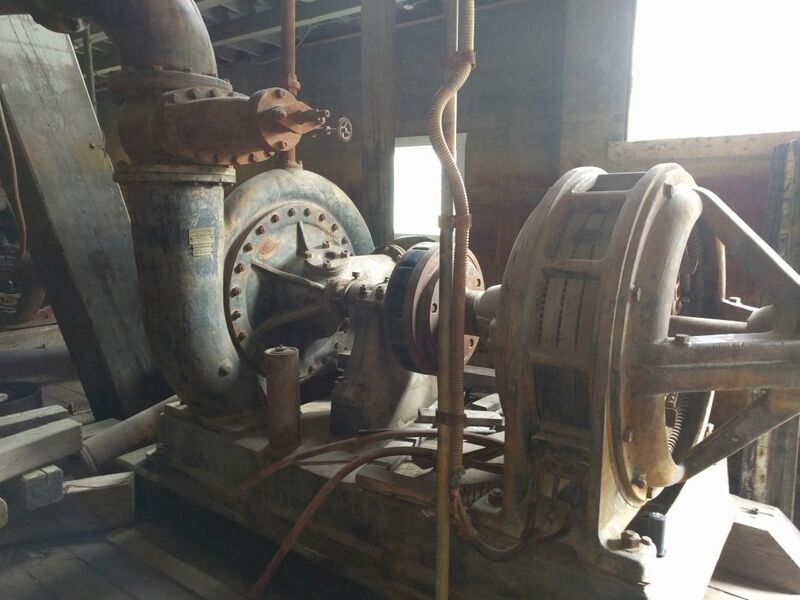 They contract with a local mining company to offer hour long tours of the dredge in which you see all parts of it. Our tour guide was very knowledgeable and was able to answer all the question thrown at her. 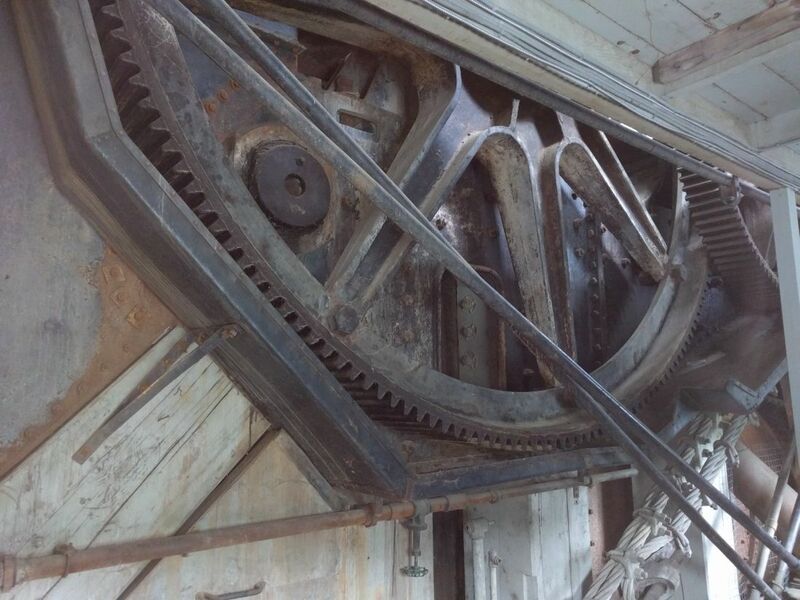 The list of interesting aspects of the gold dredging are just to long to go into here, but if you like history and things mechanical you won’t be disappointed. 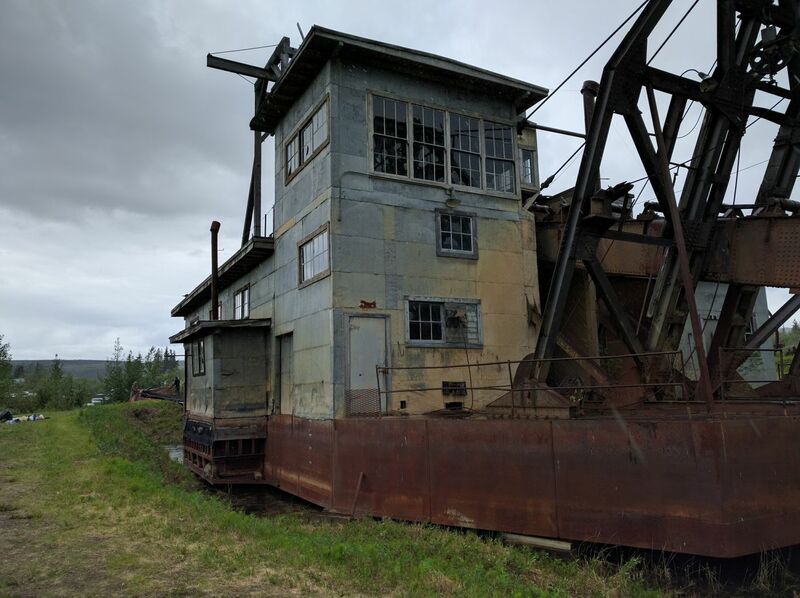 I’m aware of what a mess these dredges made of the many of the gold bearing creeks in the Yukon, but the engineering story is still fascinating. There is a TV series called Gold Rush that (among other things) follows the efforts of miner Tony Beets to dismantle and move a 75 year old gold mining dredge to be put back into active mining use. Interesting watching if you can get over the usual over dramatized reality show treatment. 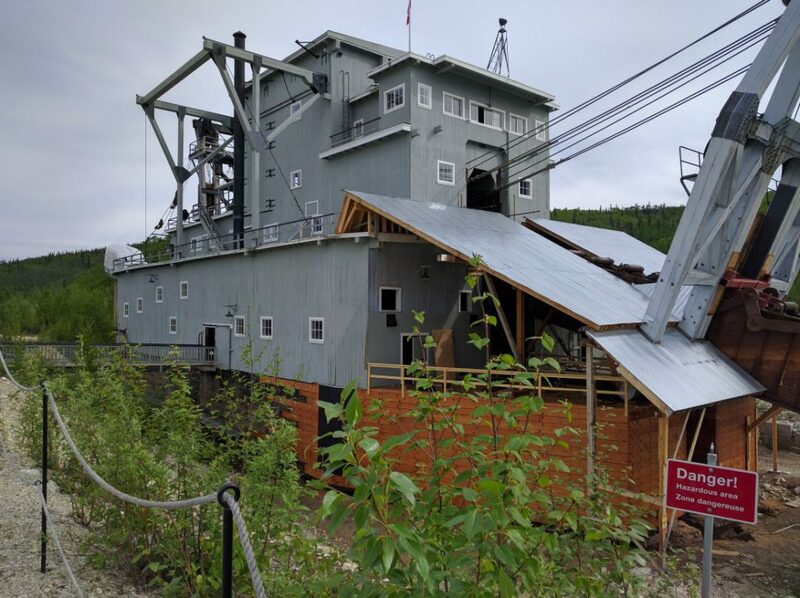 The dredge tour tickets are normally $20, but this season as part of the Canada 150 years celebration, Parks Canada is offering free tickets if you have the Parks Canada 150 year pass. Just stop in at the Dawson City VC to pick up the tickets. The Parks Canada 150 year pass is free — see their website, and it gets you into many of the CA parks for free this year — this is for 2017 only. You can take Top of the World Highway east from Dawson City to rejoin the main Alaska Highway at Tok. Its a mostly ridgeline highway with nice broad views of the mountains its going through. A few patches of gravel, but all good. 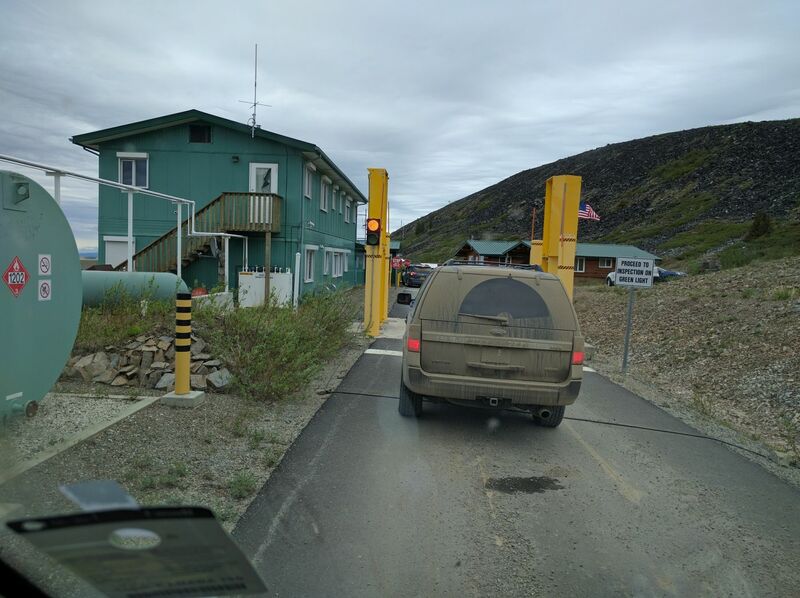 The highway crosses into AK at what must be one of the more remote and high altitude border crossings — have your passports ready. Top of the World Highway — well named. 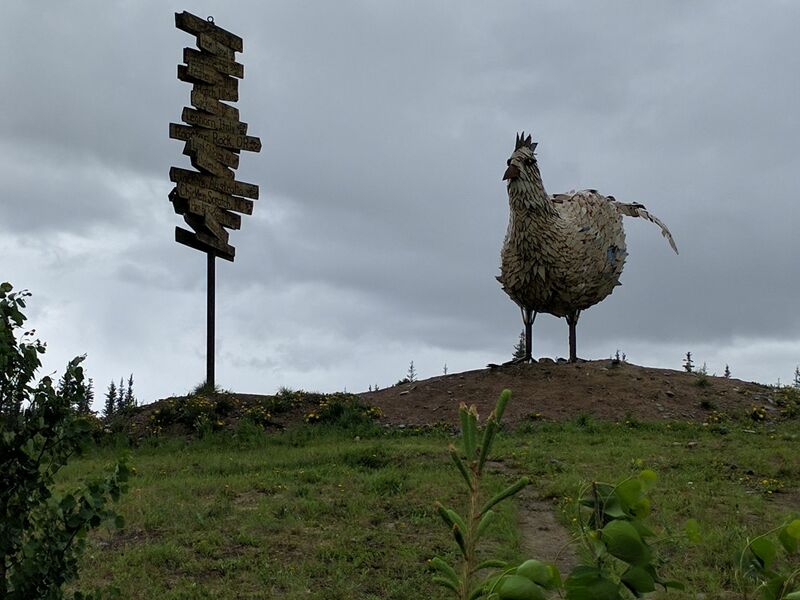 Chicken is a quirky little town with good homemade pie and a shop to buy gold mining equipment in. Also home of the Pedro gold dredge (with tours). Chicken is laid out in a strange way — there are basically 3 separate towns, so you have to look around to see it all. We had good memories of Homer and the Homer peninsula from an earlier trip and decided to go down there again. Have to say is was just a bit disappointing. 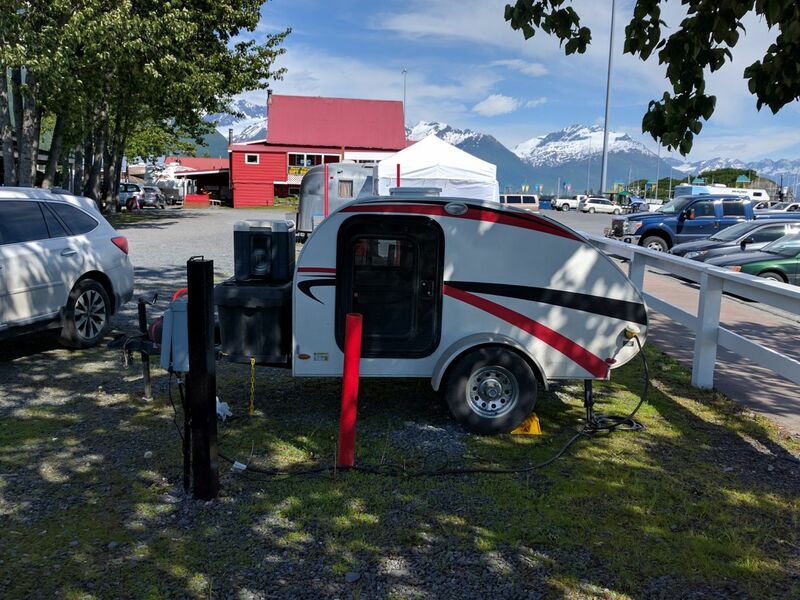 Its a long drive down to Homer from Anchorage with pretty heavy traffic, and while Homer is a quirky and interesting town with nice ocean camping on the Homer Spit, it was the only place we visited where we thought it was kind of busy/crowded. Maybe early or late in the season would be better. 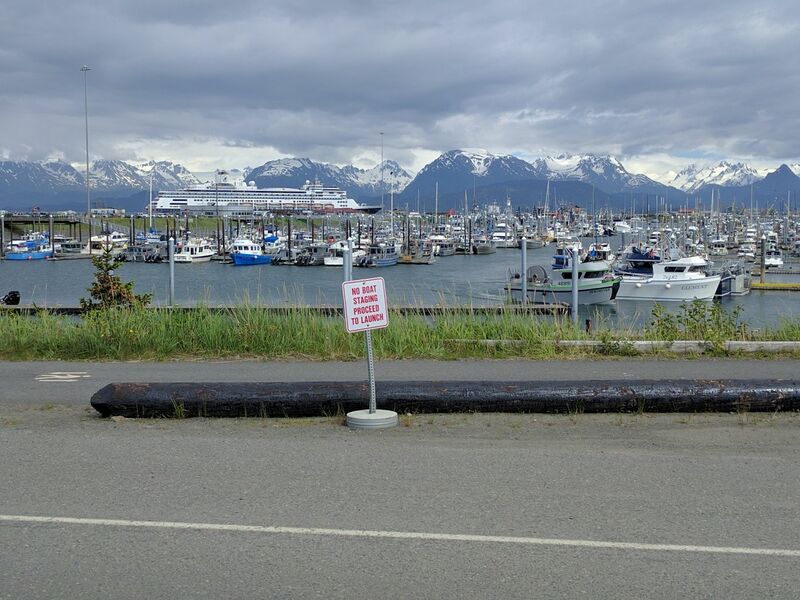 We camped on the Homer Spit in the city(?) 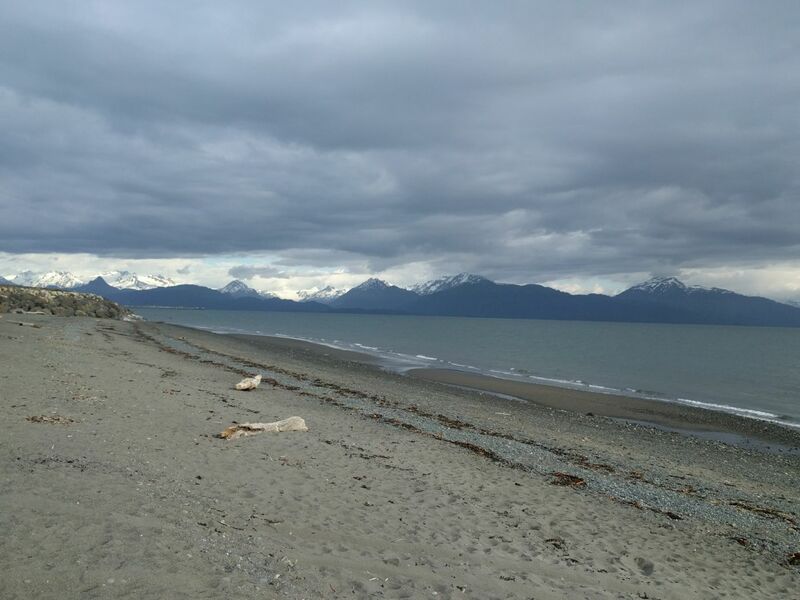 run campground which is right at the start of the spit and has great views and a good beach. 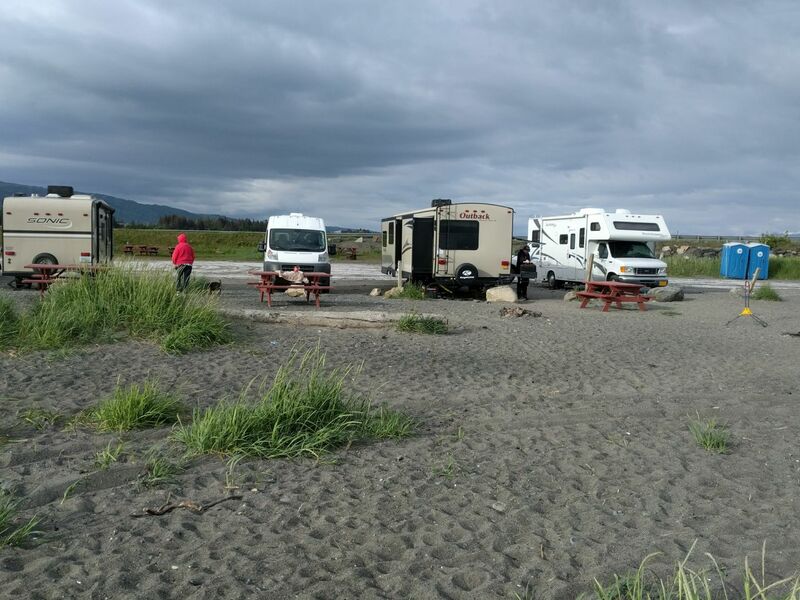 Oddly, this campground does not fill up fast, even though the commercial RV parks further down the spit that charge a lot more and generally don’t have nearly as nice a beach and views were mostly full. I guess if you need the shore power, you don’t have much choice — another advantage of being independent of shore power etc. 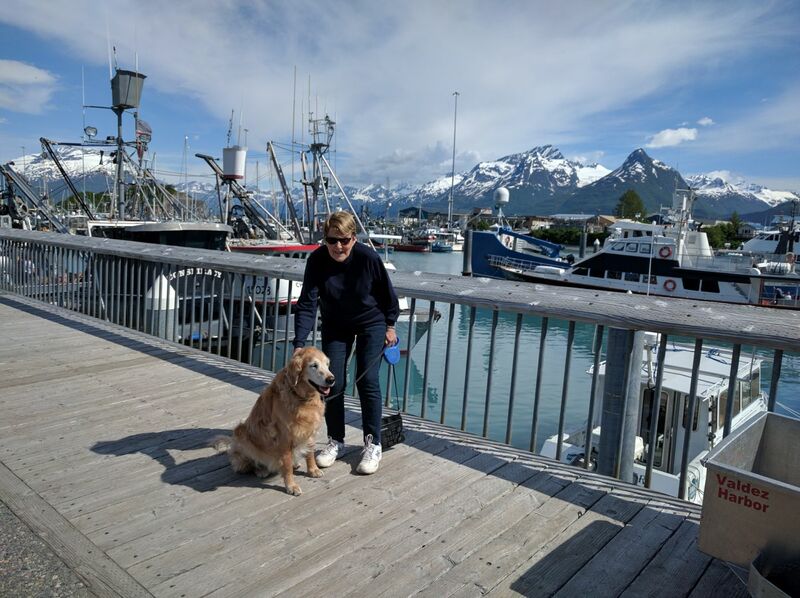 We had not been to Valdez on earlier trips and decided to have a look this time. Basically you have to leave the Alaska Highway and drive 110 miles south to Valdez via the Richardson Highway and then retrace your steps back to the Alaska Highway. 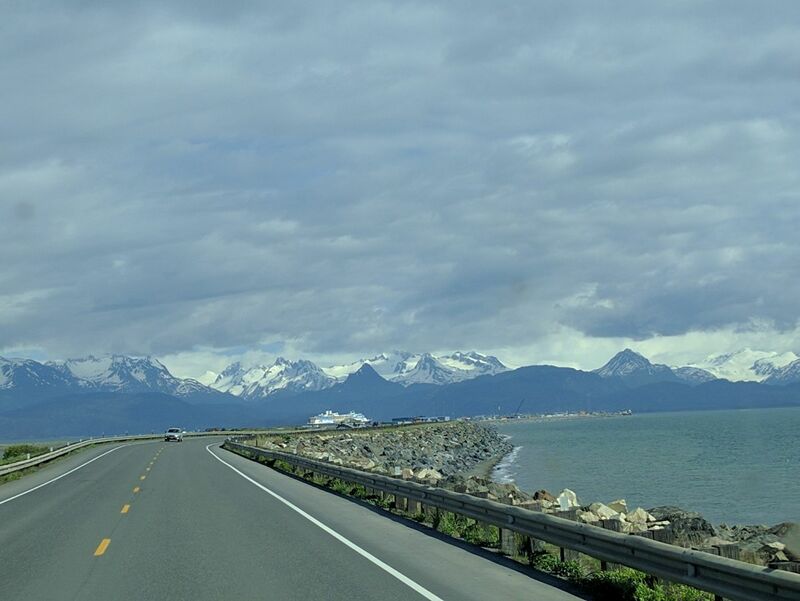 We liked the drive down to Valdez and the city quite a bit. 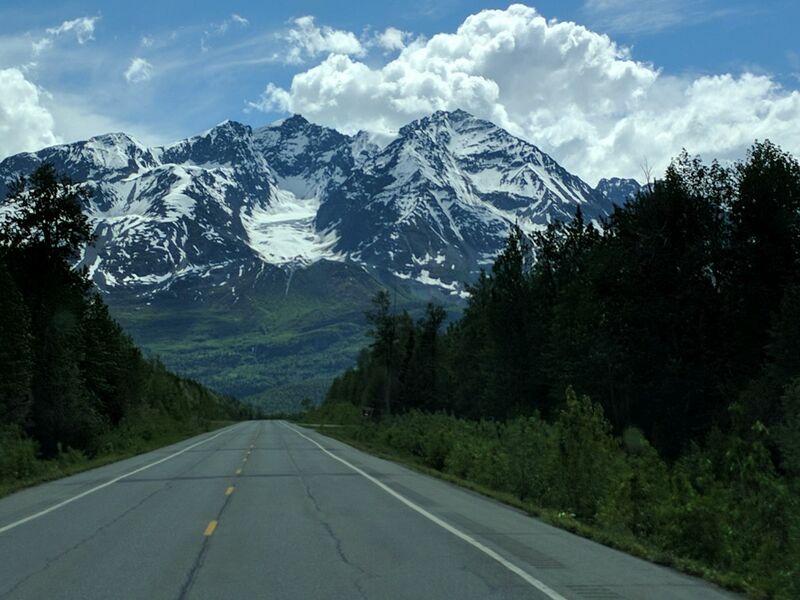 The drive is quite scenic with good views of the Wrangell – St Elias mountains. 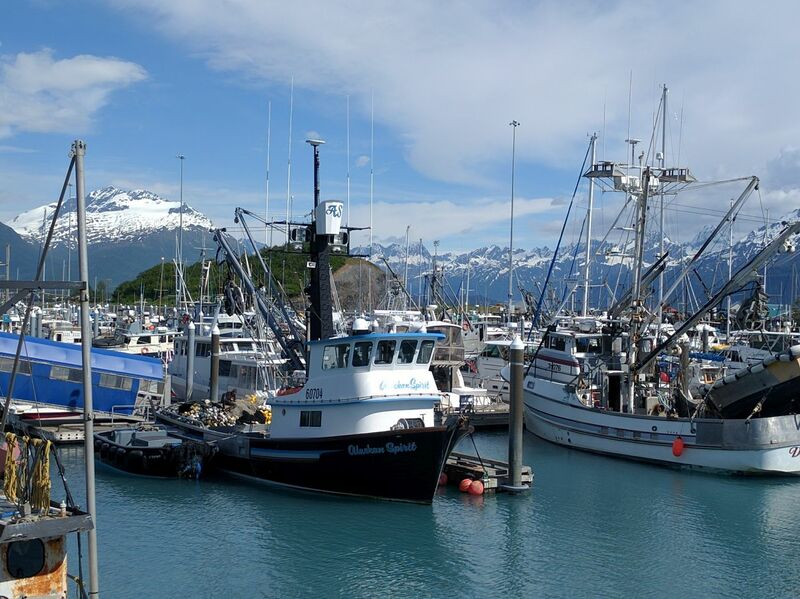 The city is a fishing town and is also the terminus of the Alaska Pipeline — pretty town, and not unduly busy with tourists. 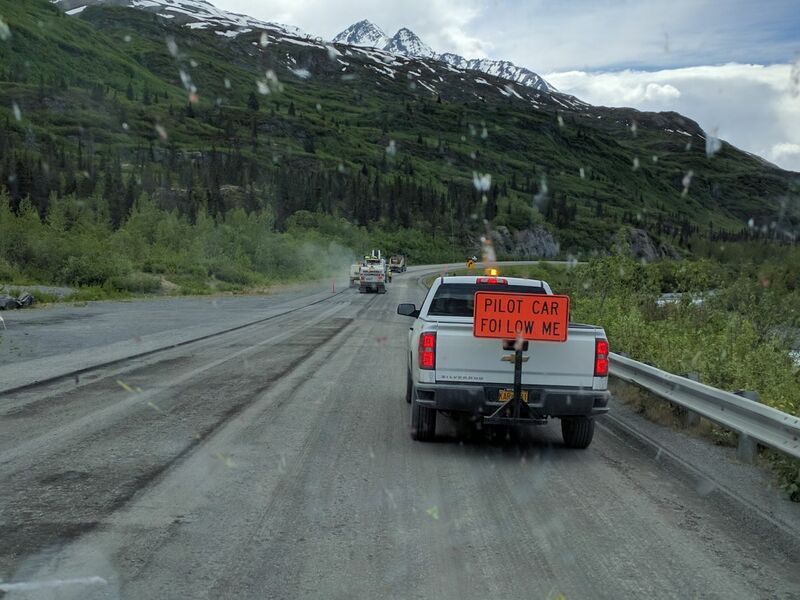 Alaska/Yukon has two seasons: winter and road construction season. The couple in the Teardrop trailer pictured above was all the way from Waco, TX and were enjoying life in the teardrop quite a lot. The road down to Valdez has a turnoff that takes you into the Kennecott copper mine and the small town of McCarthy area, which looks quite interesting. Its quite a few miles of gravel, and we opted not to go this time, but its something I’d like to do at some point. The Kennecott mine is no longer active, but some of the buildings have been restored by Parks Canada and tours are available. It looks like an interesting area. 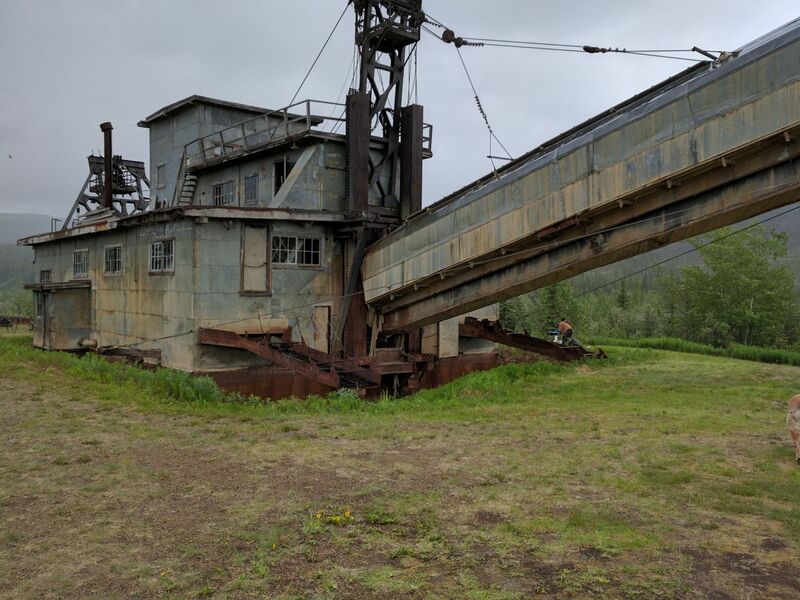 There is a big and informative visitor center not far down the Richardson Highway from Glenallen — it has quite a bit of info on the Kennecott mine. We took the main branch of the Alaska Highway back. The areas going through Mucho Lake and Stone Mountain parks are very nice. We ended up going back via Jasper and Banff again as it was only a little out of the way compared to going through Edmonton. A couple places that I’d highly recommend that we did not go to this time are Glacier Bay and the Denali area. 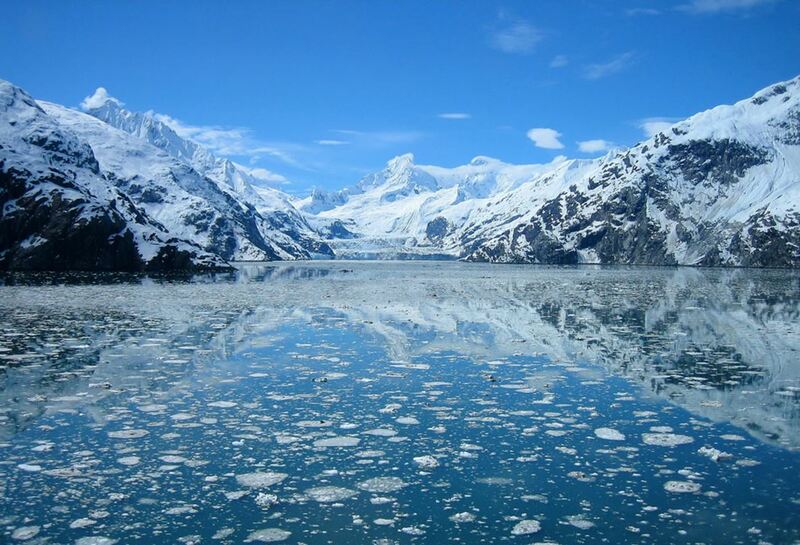 Glacier Bay is one of my all-time favorite Alaska places. Taking a small tour boat for a day trip up the bay is just great for both the scenery and wildlife. 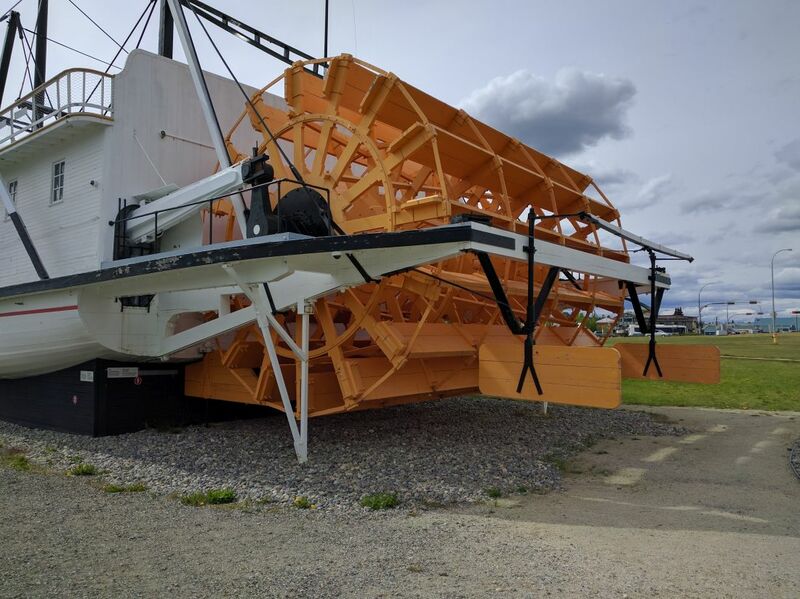 You have to fly in (say from Skagway) and stay in their campground or lodge and probably have to book the boat ahead. Anyway, you can’t really go wrong in the Yukon — just do a little planning and go! 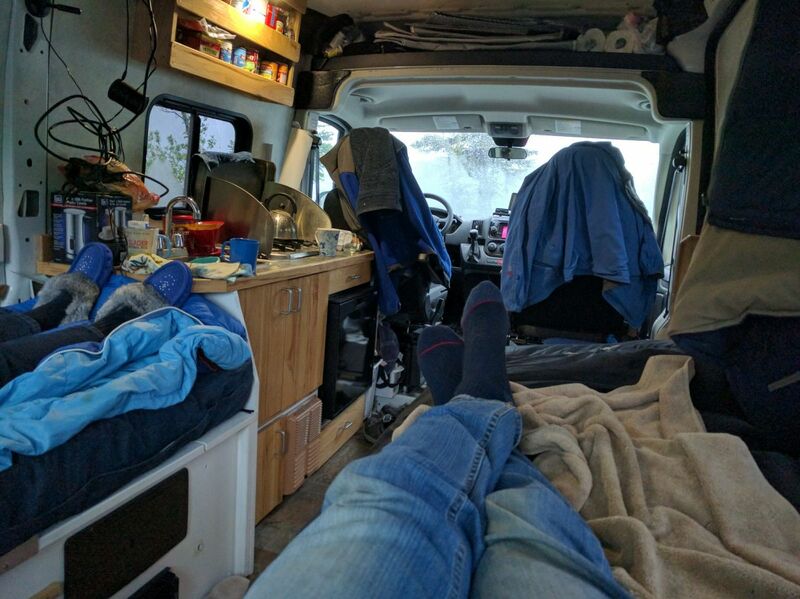 End of day in our messy (but comfortable) van. Again, very inspiring Gary. 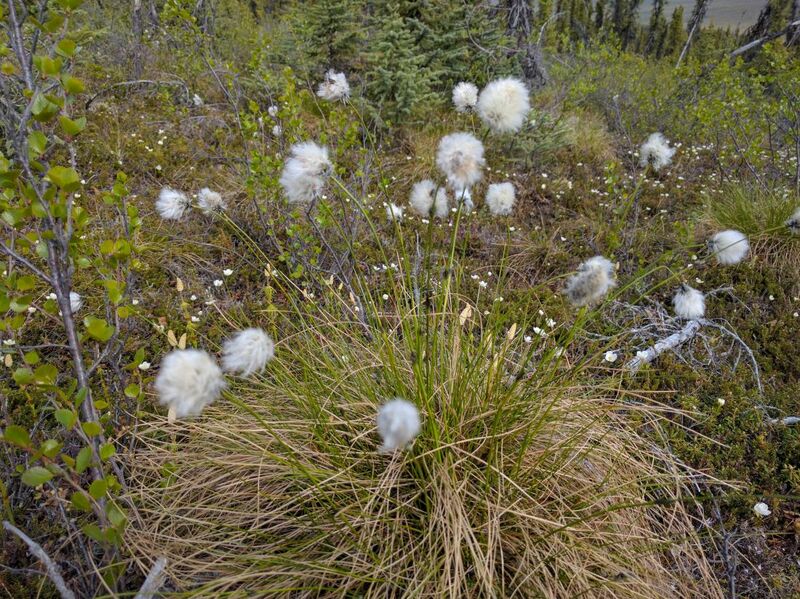 I was wondering about the Yukon and think I will try to include it on the trip. I want to make it to the Arctic Circle and then even to the Arctic Ocean. Whoa! 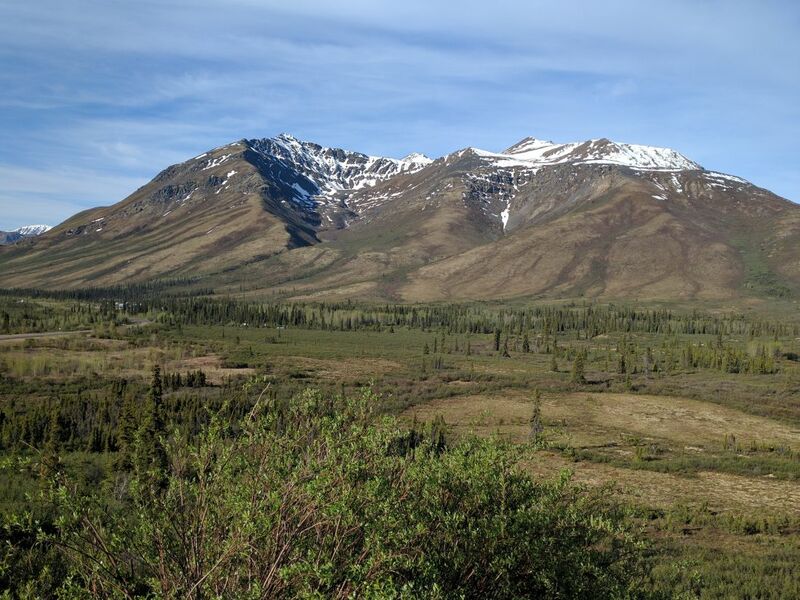 The Dempster Highway is amazing — you won’t regret it. My partner wants to know about places to shower. Are there places up there or are you on your own? I would like to know how the Promaster is holding up? How many miles on yours? Is clearance OK? Our van does not have a shower, so our technique is to spend a motel night about every 4th night or so to shower. In the van we do a little washup each morning that is quick and simple. There are plenty of motels and cabins along the route and there are also commercial and government campgrounds with good shower facilities. I’m guessing the Milepost book (a must for the trip) gives details on which places have showers. 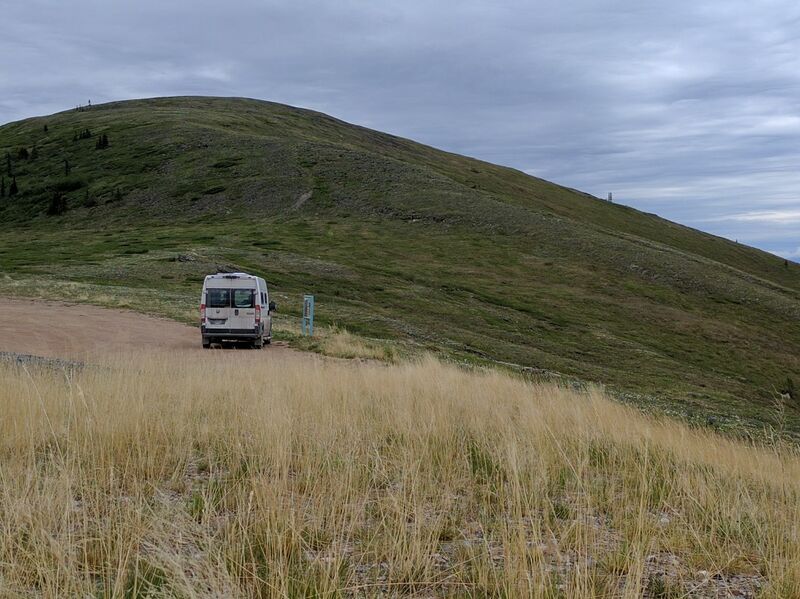 There are a lot of conversions that include a shower, but we decided not to go that way so that we could go with the 136 wheelbase smaller van and because we have had RVs in the past that had and shower and found that we just did not use the onboard shower. We are at 73,000 miles on the ProMaster and by and large it has been fine. Since the Yukon trip we did have an issue with a defective oil pressure sensor that turns the check engine light on even though the oil pressure is fine. I’d just have it replaced except that its hard to get to and the labor is kind of high even though the new pressure sensor is only a $35 part. Not really a big deal. Another problem we had just recently was a rabbit chewing through some wiring. Not really a problem that is chargeable to the ProMaster as lots of cars have had this issue in rural areas. I managed to repair this issue myself at essentially no cost other than my labor. So, overall, I’d say it’s doing fine. We are planning a long trip down to the gulf next month, so we still have confidence in it. 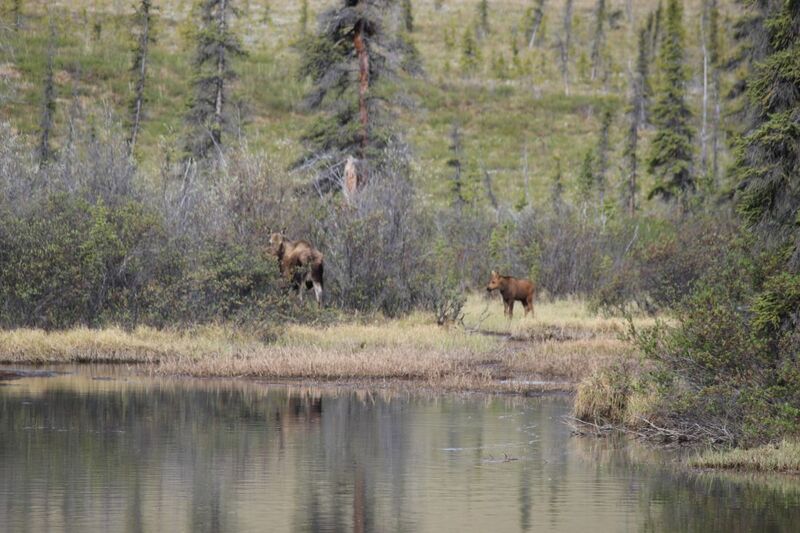 Also talking about another trip up to the Yukon — its kind of addicting. This is our 4th RV and I’d say the most successful and satisfying one. Hi again — forgot to mention that the ground clearance is fine. When you look at the PM from the back, the back axle clearance looks low, but its almost 8 inches, which is fine (similar to most SUVs). For the big AK and YK gravel roads like the Dempster hwy, Top-Of-The-World hwy, and Dalton hwy you will have zero problem with clearance. If you like to seek out really challenging jeep trails, then the PM is not so good for that. The only problem we have had with backroads is heavily washboarded gravel roads where the PM tends to give you a rough ride. This can be alleviated to some degree by lowering tire pressure and going slow. We also replaced the rear shocks at about 60K miles with Bilsteins and this helps quite a bit on heavily washboarded roads. I’d like to get there pre-bug season as much as possible. When did you leave on this trip? 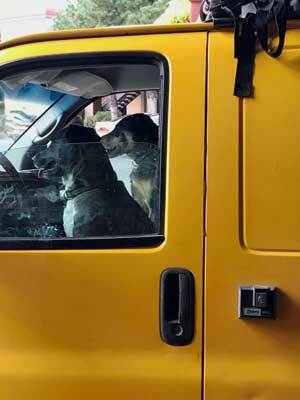 I like your van crew! We took our dog along too and he had a great time. 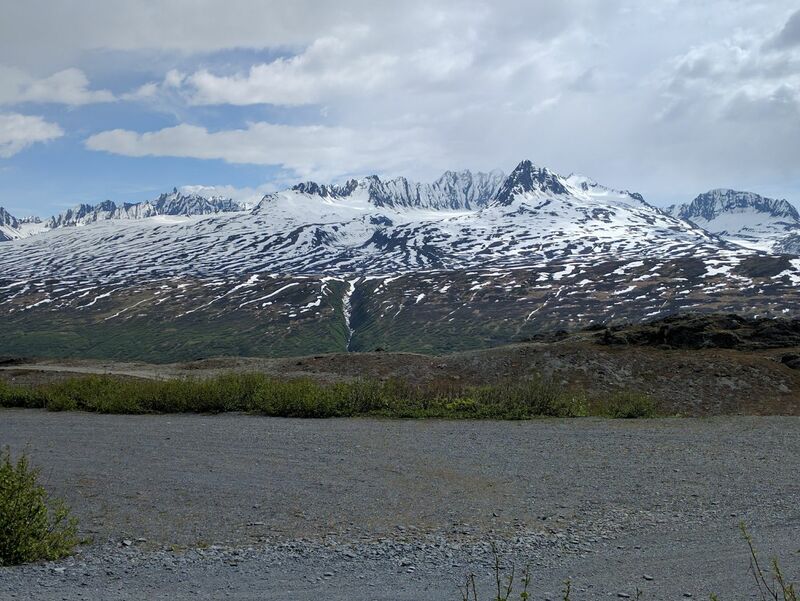 We left home (Montana) on June 1, so we were up in AK and YK starting around June 7. The bugs were never a problem on the trip — not sure if we were just lucky or not. Its good to checkout the AK weather by season — my recollection is that they have dry springs. If you go much earlier than late May it will be quiet, but some stuff won’t be open yet. Hi Gary, the more I see this post the more I like it. Can’t wait till we finish our Promaster build. Home remodeling has priority but when a good stopping point is reached, I work on the van. Great trip and yes we will take a second spare. A long haul, but worth it. 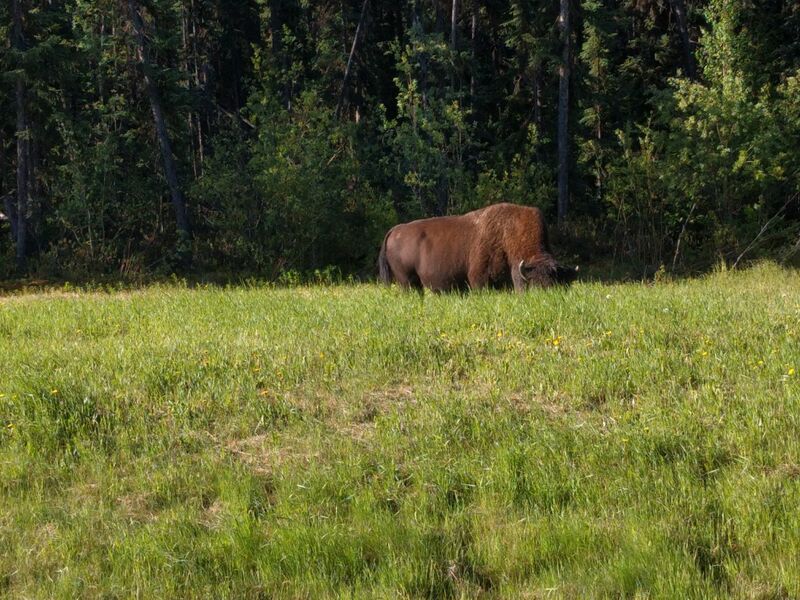 Be sure to go through Banff/Jasper on the way.